I picked this hike based on location. I’m on my way to Sylacauga for a business trip. 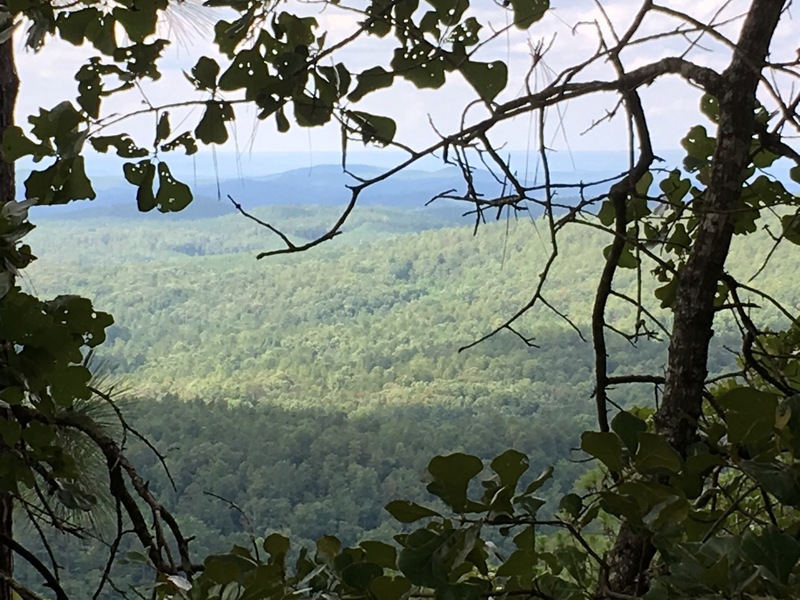 This hike was just West of Sylacauga giving me the perfect opportunity to squeeze in a hike. This hike was difficult, both to find and hike. I basically drove around Flagg Mountain looking for the trail head. 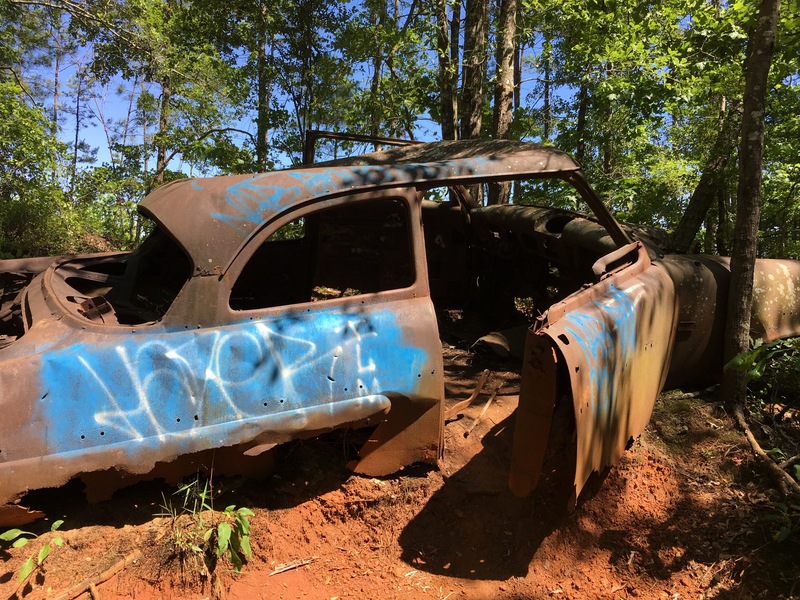 I found it after several miles down the worst dirt roads I’ve seen for some time. 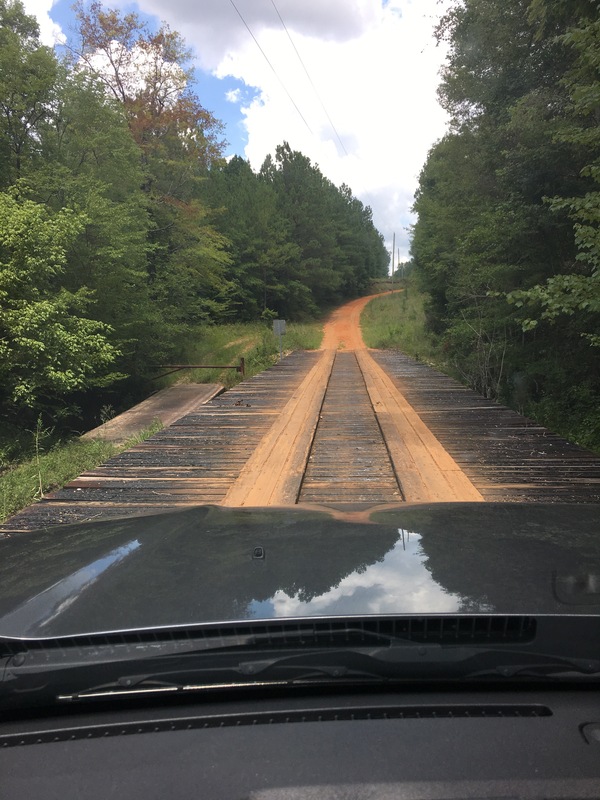 I’m not sure which bridge I trusted more, the “new” bridge in front of me or the “old” bridge to the left. The old bridge was basically an old WWII temporary bridge. 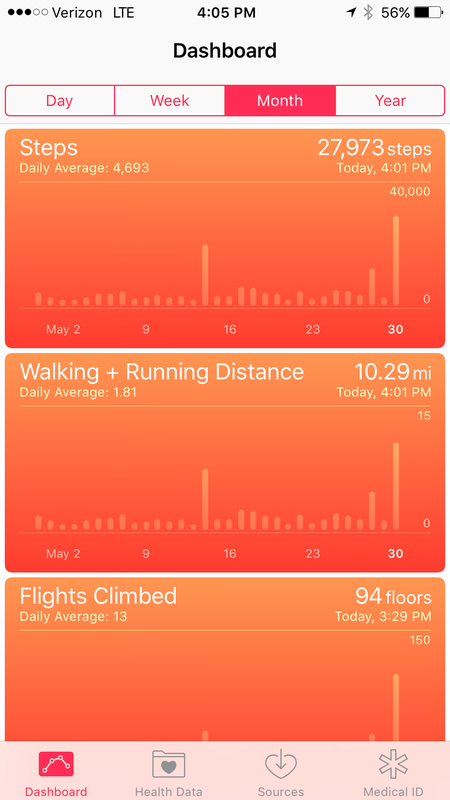 The trail itself was roughly 5 miles and 118 flights. Every time I start feeling that my conditioning has improved, a hike like this comes along. The 118 flight were very difficult in the Alabama heat. 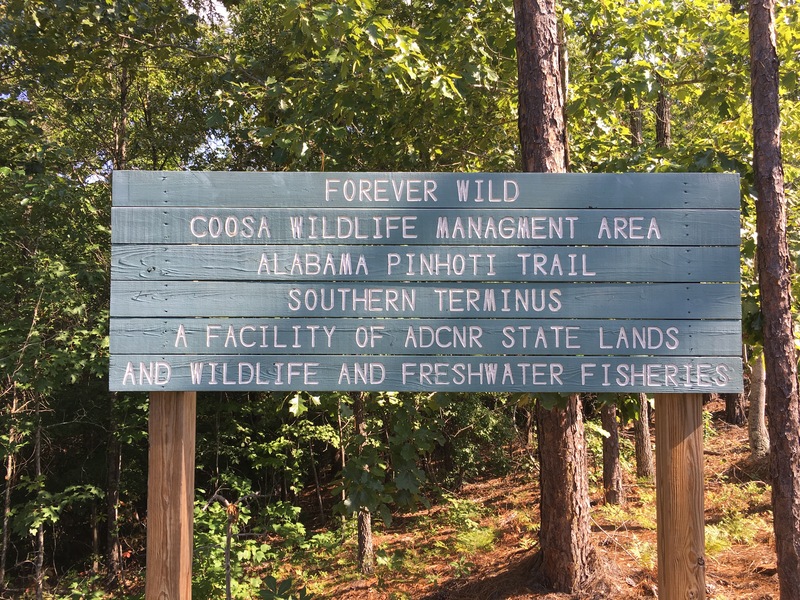 This trail is the Southernmost point of the Pinhoti Trail. 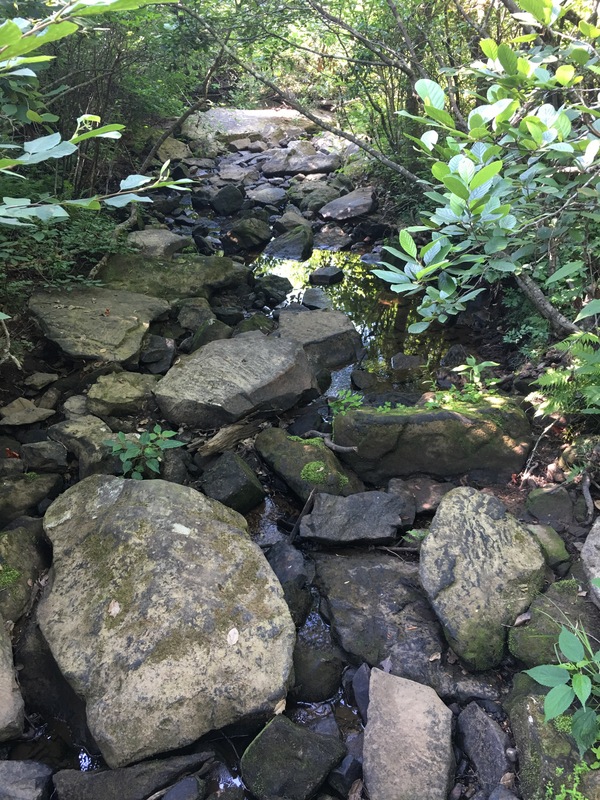 The Pinhoti continues to the Appalachian Trail. 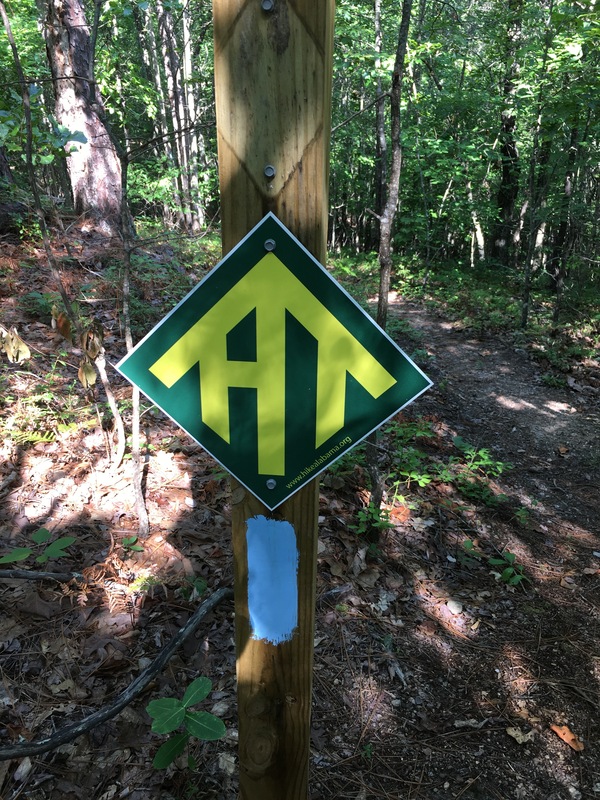 There has been some effort made to extend the AT to this point. The trail itself was narrow but well blazed. 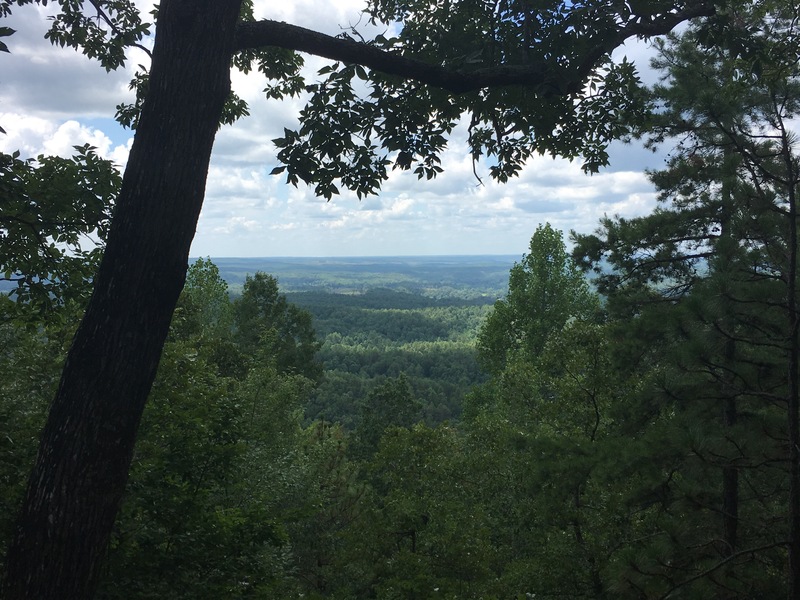 I followed the blue blazes of the Pinhoti until I reached the white blazes that head to some old cabins and the fire tower itself. There were a few trees across the trail but also a great deal of evidence that the trail is being kept up. Unfortunately, the fire tower is currently closed to the public. I understand that a conservation project is underway. I feel like this area is a missed opportunity. 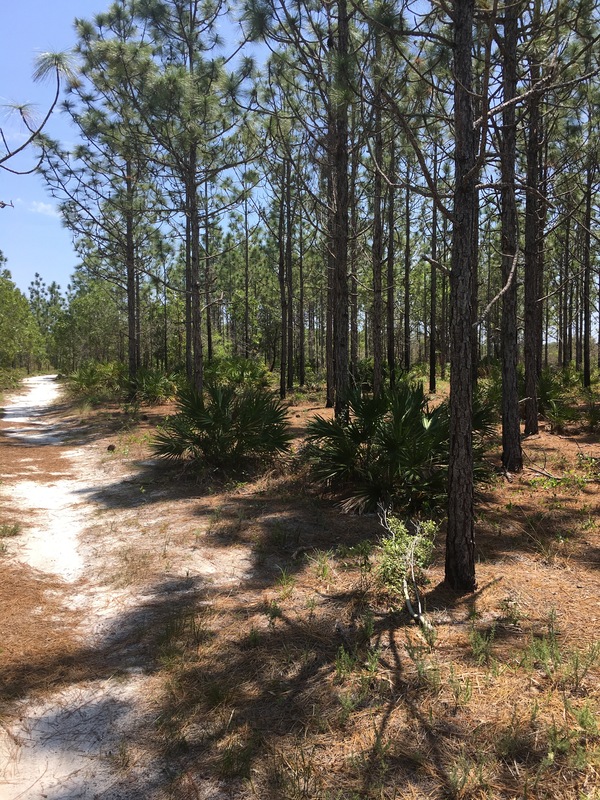 This land is protected as a wildlife habitat but would make a nice state park with a little effort. 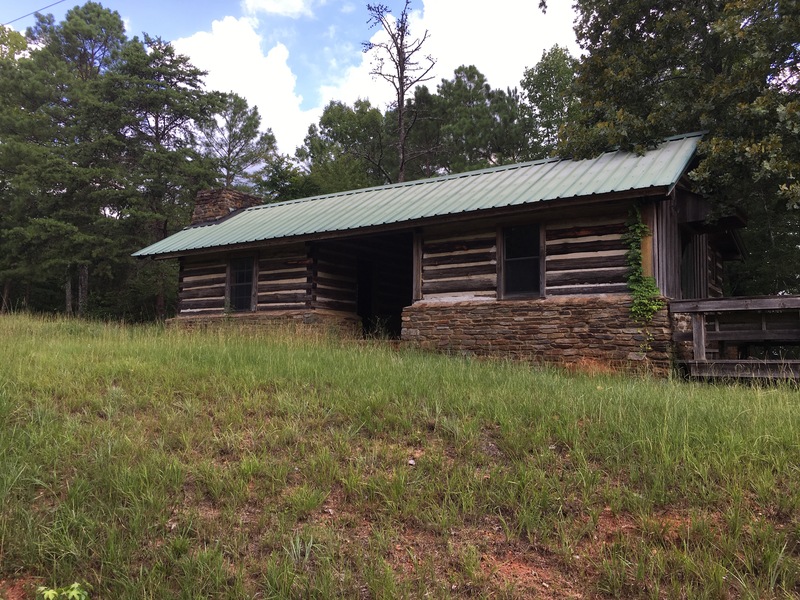 A few rustic cabins and some road work would reveal the full potential of this special place. The views were fantastic. I only wished I could have seen the view from the tower. Definitely not for couch potatoes, but with some effort great views are for the taking. We had a very active Fourth of July weekend. 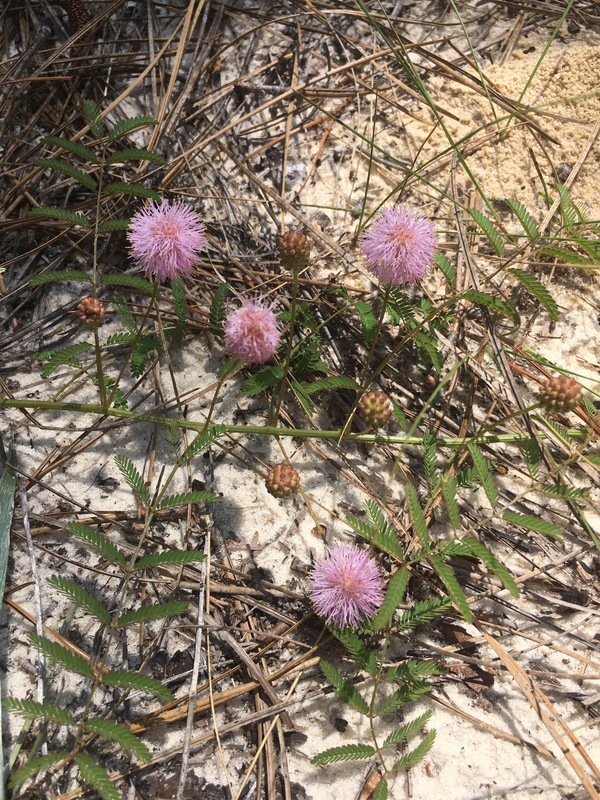 After deciding to stay in a cabin at DeSoto State Park, a place new to us both, we were able to get in several trails and some kayaking along the way. Only fifteen more trails to go in my 52 hike challenge. The DeSoto Scout Trail, or at least the small portion that we hiked, starts off the pool parking lot in DeSoto State Park (DSP). 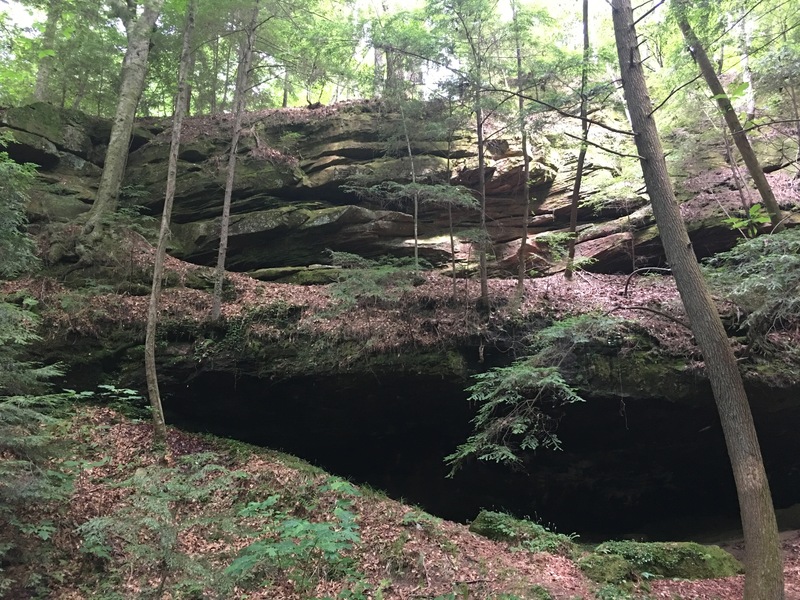 The entire trail is around sixteen miles. 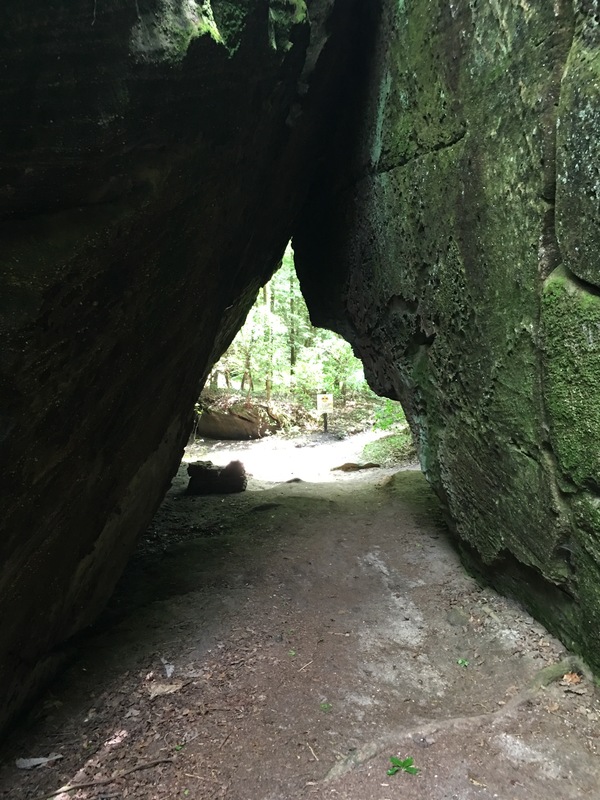 This portion takes you down to the bluffs overlooking a waterfall and the Little River below. 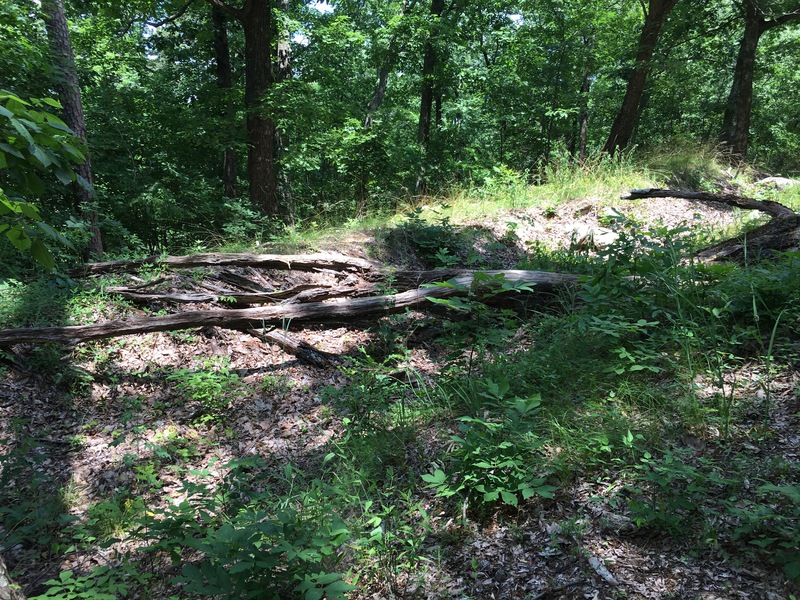 You will also run into a CCC built resting station and overlook. The river and resulting waterfall was very low due to our current dry conditions. In fact, this will be a theme for all our hikes this weekend. These falls are spectacular when the river is full but only a trickle this weekend. 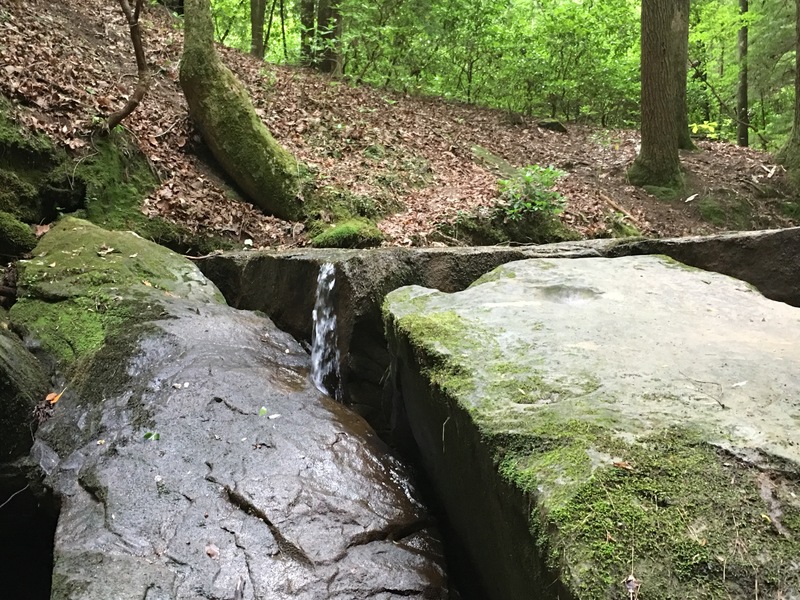 We were told most of the small falls were actually dry at the moment. 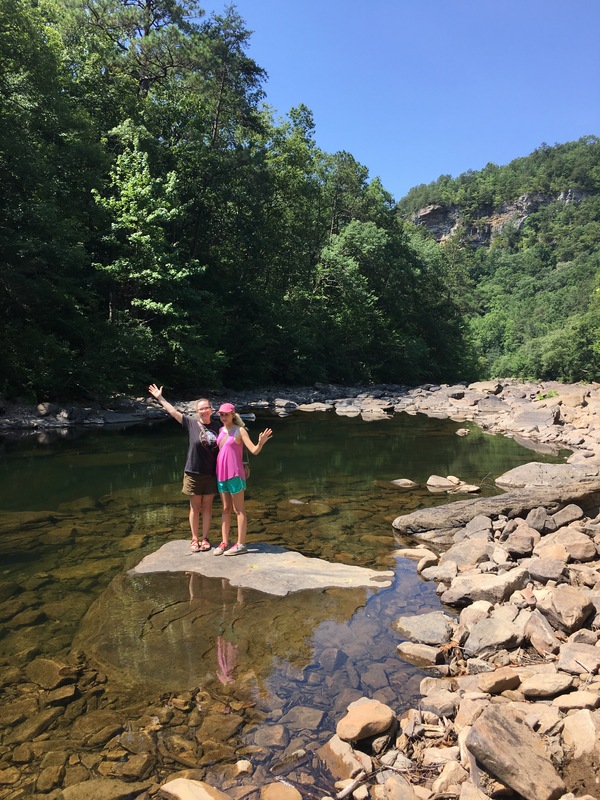 We decided on the Family Loop Trail instead of the Lost Falls Trail since the falls were dry. 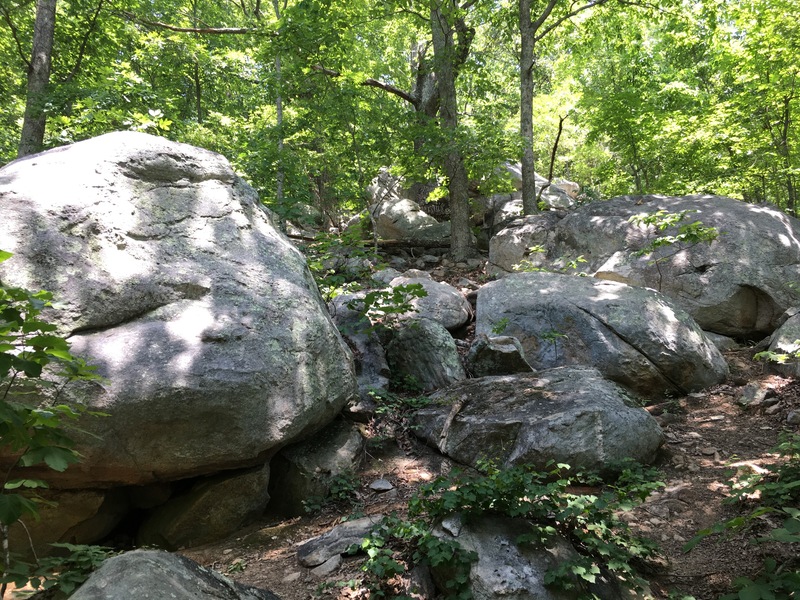 The Family Loop Trail was pretty uneventful and without views or a notable feature. I would not put this one on this list again. 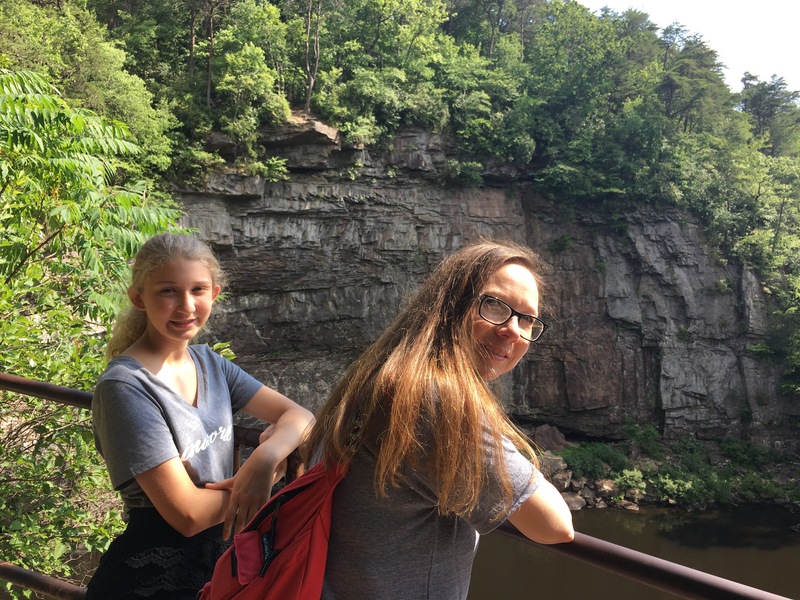 After our morning hikes, we spent the afternoon kayaking on the West Fork of the Little River, just above DeSoto Falls. 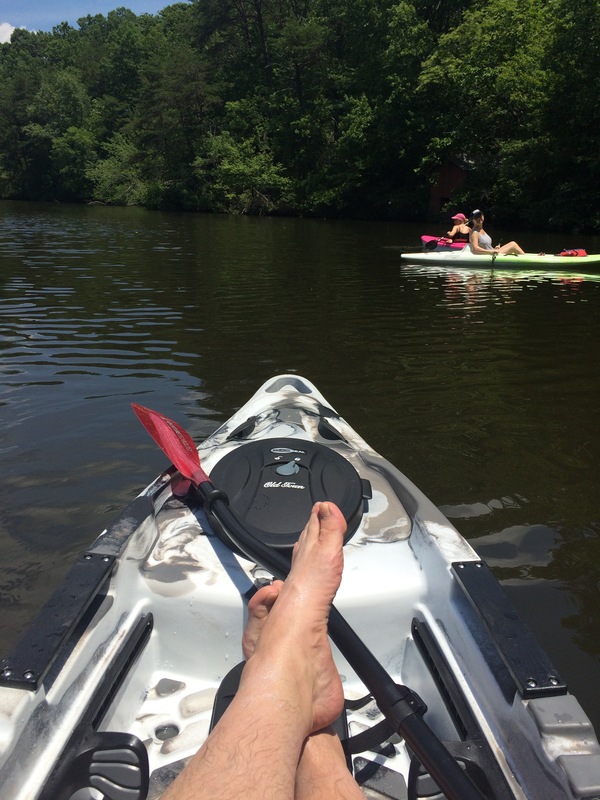 We paddled several miles up the calm river before returning to our starting point. We had a blast at the moment only to have the soreness set in that evening. 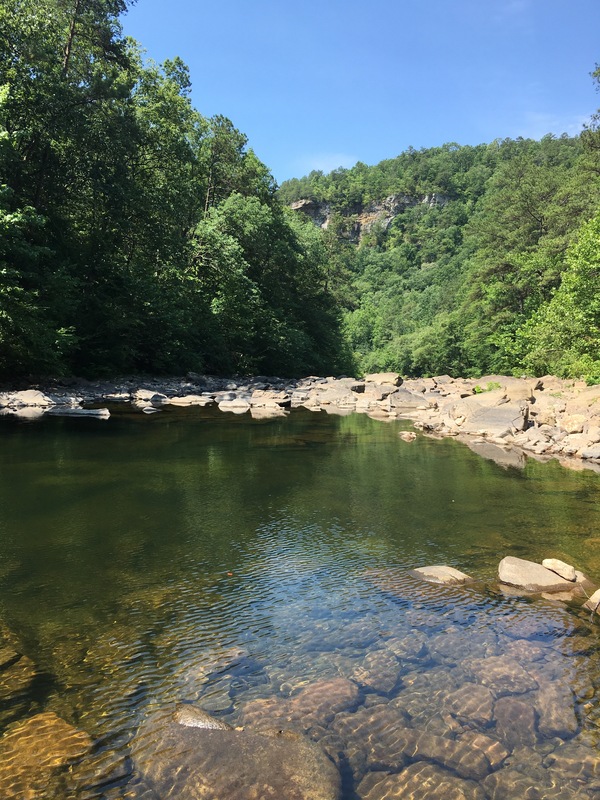 Sunday brought two more hikes in an adjacent park, The Little River Canyon. 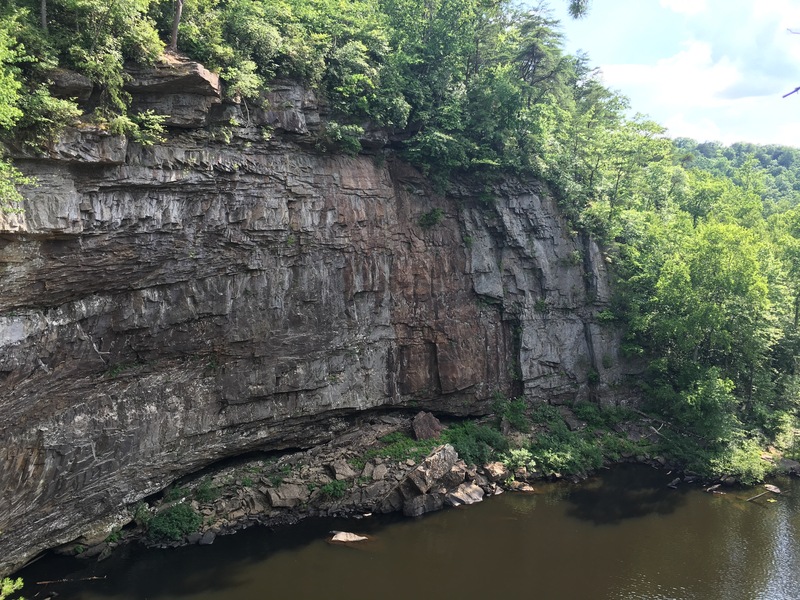 It is list as “one of” the deepest canyons east of the Mississippi. First up was the Beaver Pond Trail. This trail was listed as being perfect for those that can’t do the mountainous hikes. 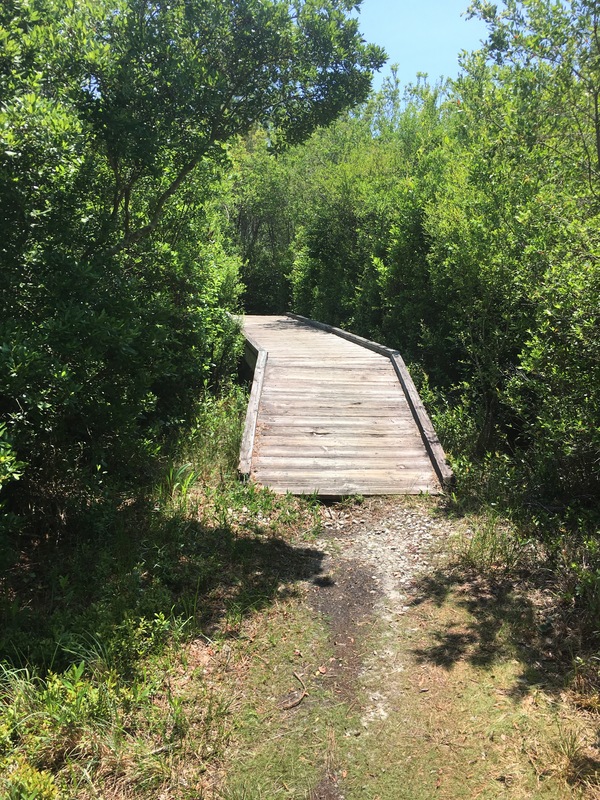 This trail worked into the forest to an observation platform on a beaver pond. Unfortunately, the lack of water was evident here as well. 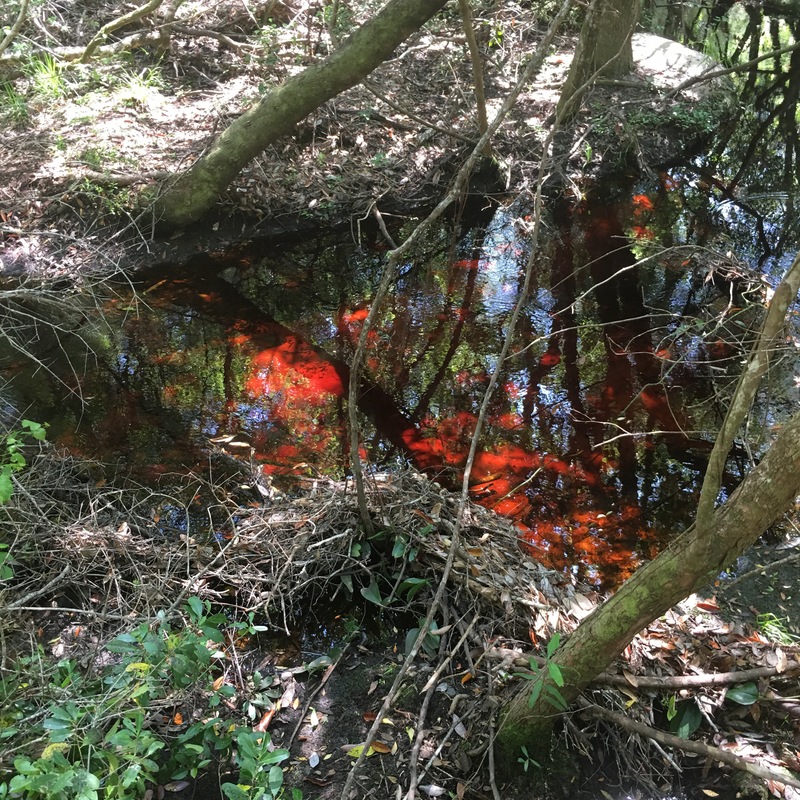 There ended up being no pond to see. 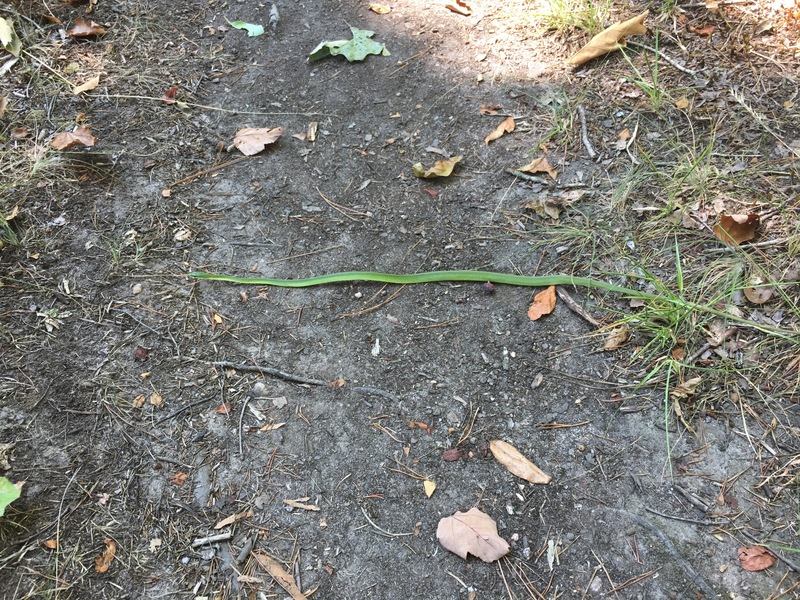 We did, on the other hand, run into my third snake of the challenge. This one was more afraid of us than we were of it. We walked around the snake so that it wouldn’t be disturbed. Our last hike this weekend was by far the most challenging. The Eberhart Trail starts at the top of the canyon and continues to the river. While relatively short, it was difficult both directions. 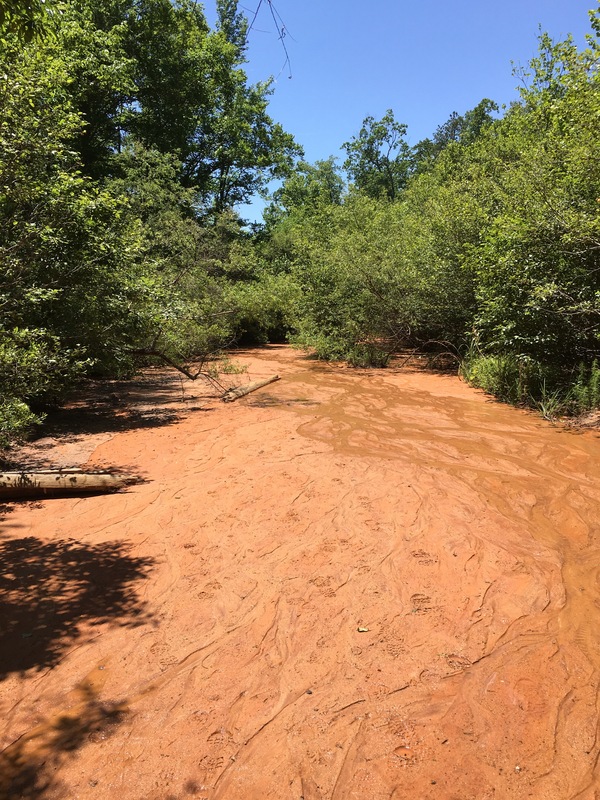 Once again, we found the river lacking water flow. It was beautiful nonetheless. 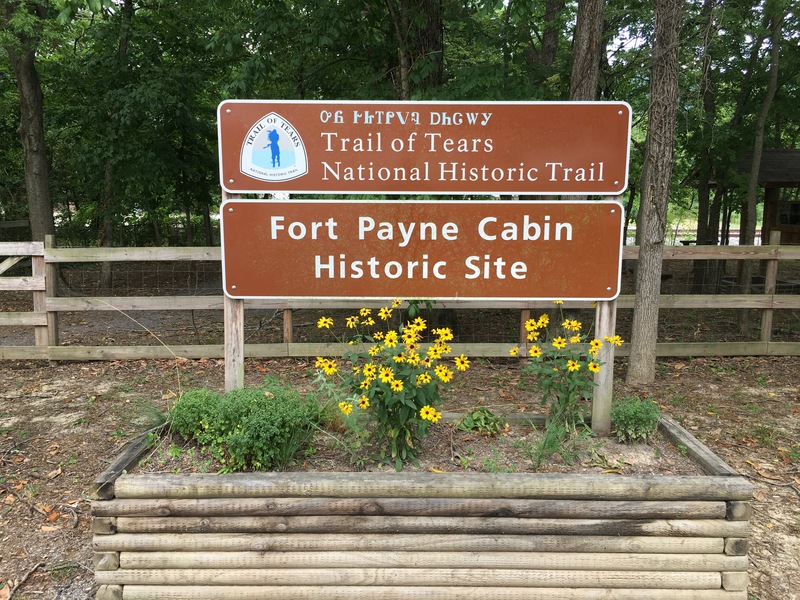 Some other points of interest for the Ft. Payne area. 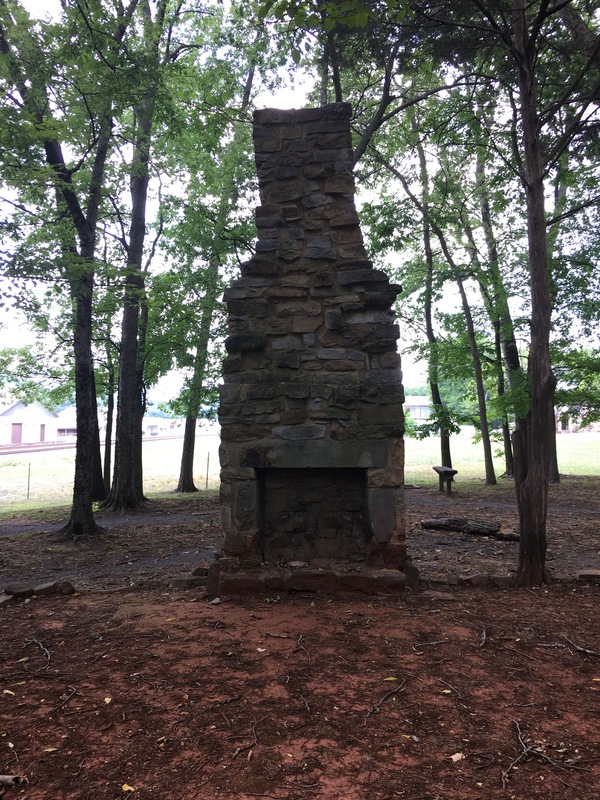 First, this was the only starting point in Alabama for the Trail of Tears. A small, temporary fort was built as a gathering place for indigenous people before heading West. 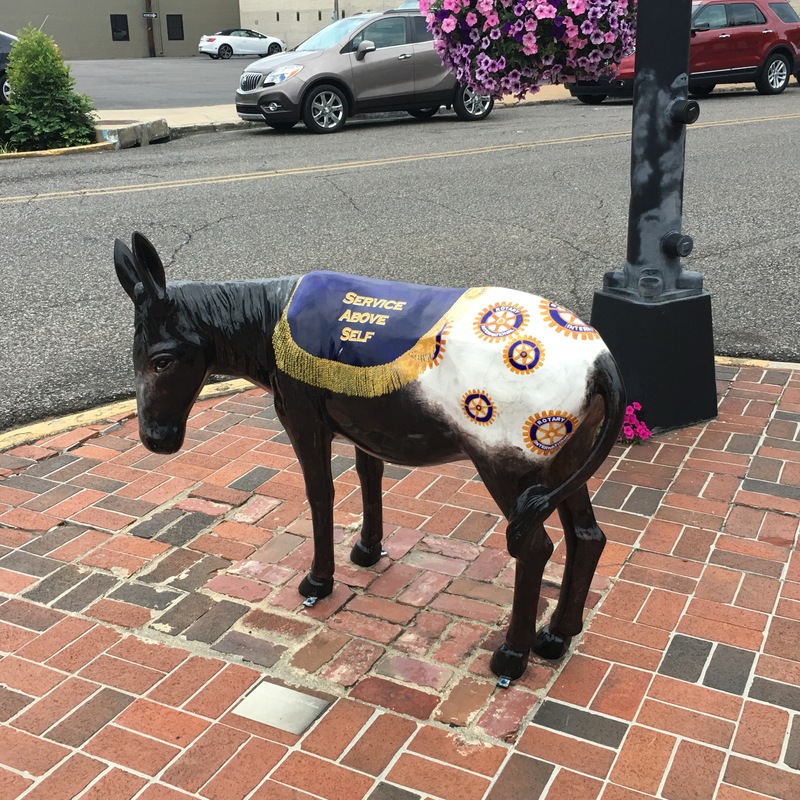 Ft. Payne was also the home of the country band “Alabama” and their statues are on the main street of town. 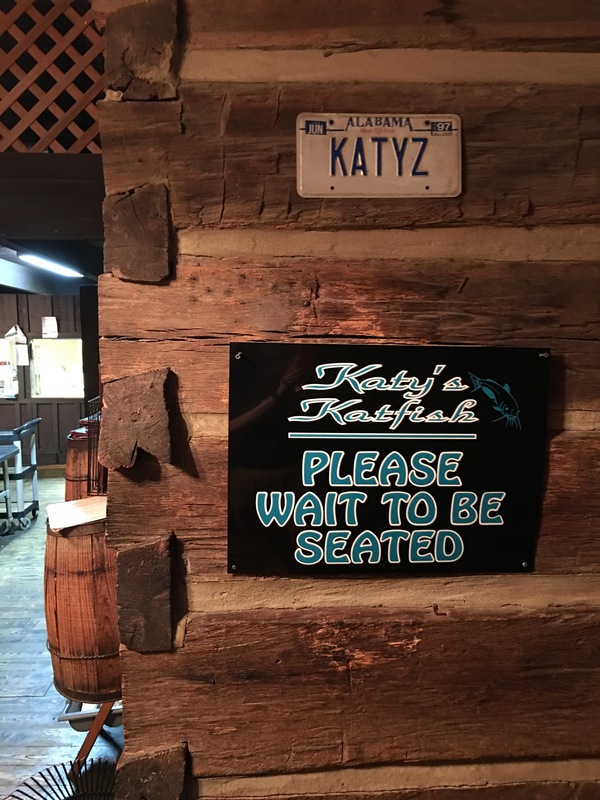 Our best meal was at Katy’s Katfish in Rainsville. It was a catfish house built around a log cabin. The fish was outstanding. I think this trip would be best in the Spring or Fall. Spring would bring higher water levels while fall would have fantastic foliage. 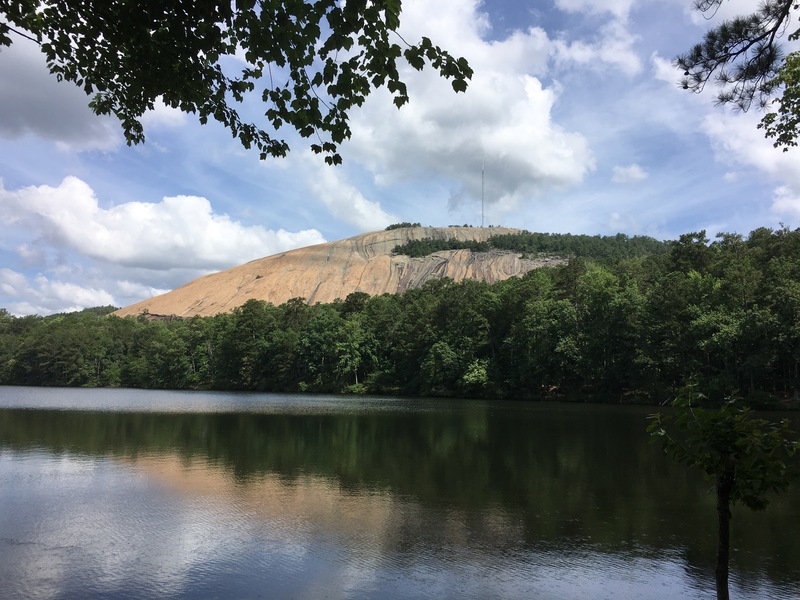 I’ve been here several times, Stone Mountain, Georgia. I’ve walked up the mountain, rode the sky lift up and down and played in the mountain’s shadow. The one thing I’ve not done will happen today, hike around the mountain. 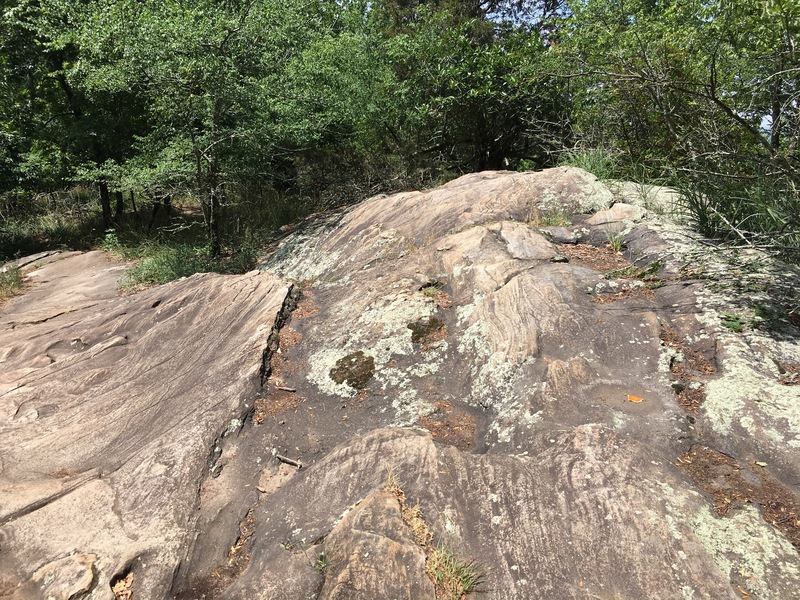 The Cherokee Trail around Stone Mountain was very well marked, in granite no less, and easy to navigate. The trail only had one steep climb that could be avoided by taking a connecting trail at the end. The trail was roughly 5.5 miles. 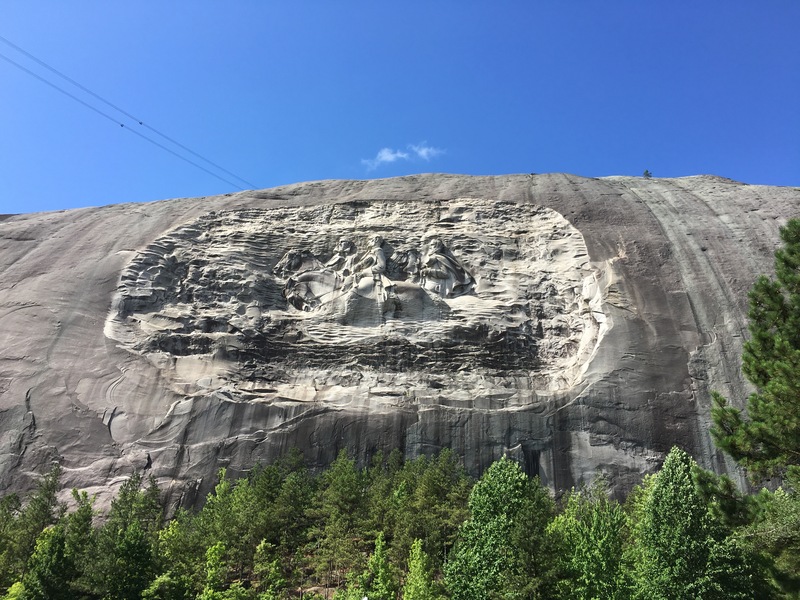 Stone Mountain is known for its large relief carving of Robert E. Lee, Stonewall Jackson and Jefferson Davis. The carving has been somewhat controversial as of late. Regardless of the political implications, I can’t help feel that this mountain has been damaged by the sculpture, not to mention the sky lift and laser show. 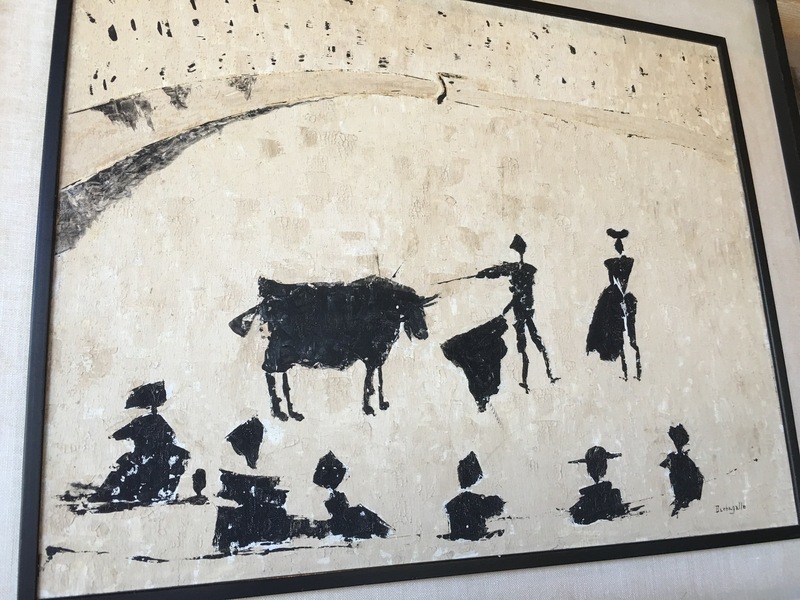 You can see in my first two pictures that the back side is very beautiful. I feel we could all benefit long term if we just left nature alone. 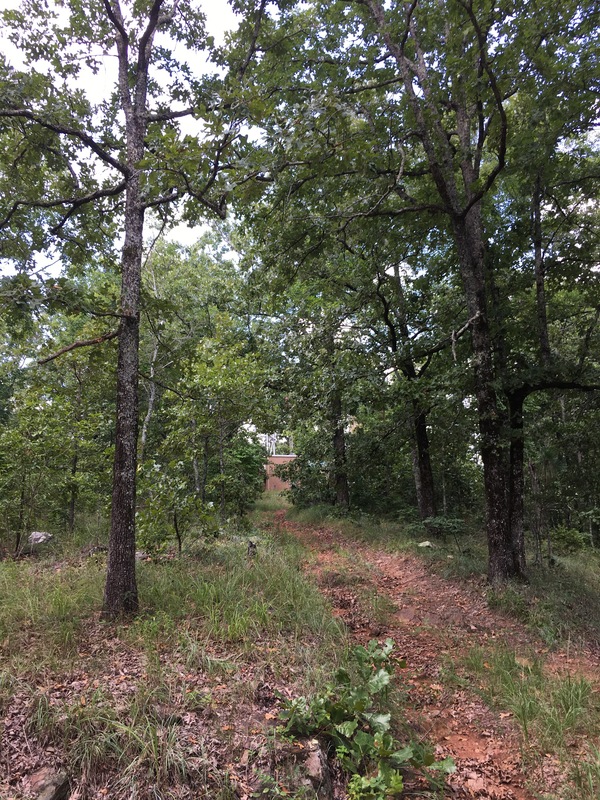 The Cherokee Trail begins at the base on the hike to the top trail. The trail proceeds through the forest until reaching the laser show event lawn allowing for a closeup view of the carving. Once across the lawn, you enter the forest and work your way to a large lake. 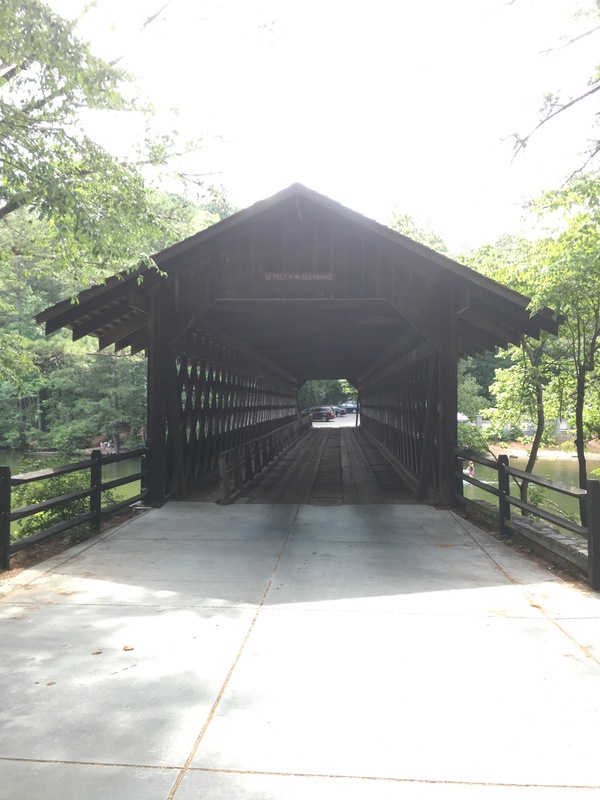 Along the way, you pass many of the park’s sites, a gristmill, covered bridge and old stone quarry. As I’ve said, this side of the mountain has had about as much damage as can be done. From here, the real beauty emerges. The trail continues around the lake to the untouched side of the mountain allowing for some great views. 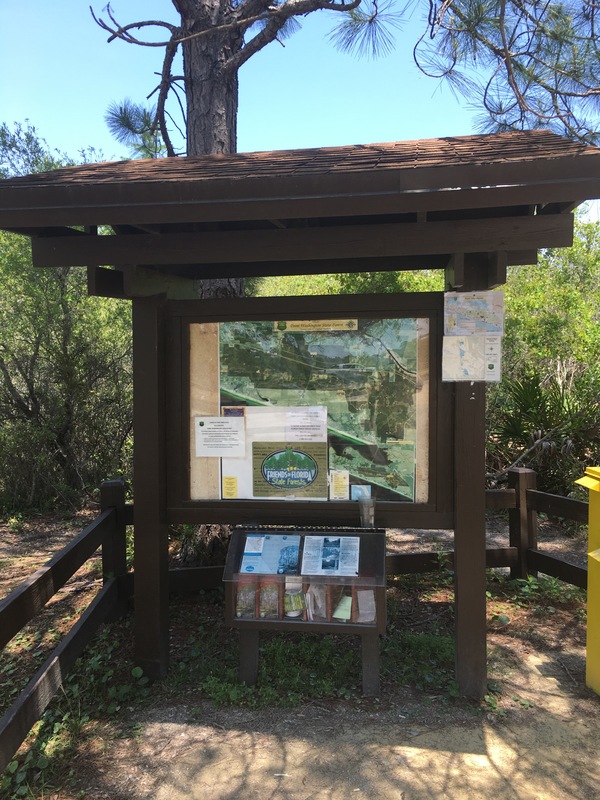 As you round the lake, you must decide to climb up the Cherokee Trail or take the flat trail extension back to the parking area. This was really a nice trail. Since we stayed the night, we had time for a couple of nice meals in Atlanta. 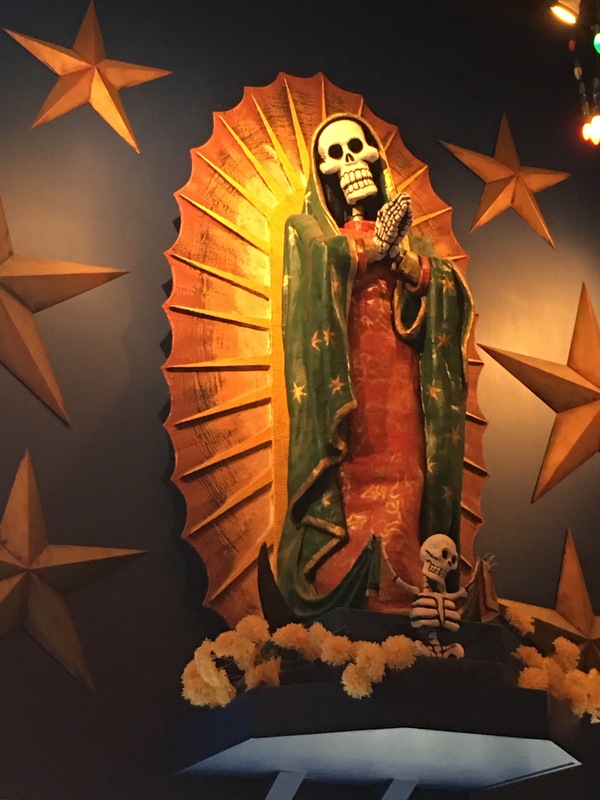 First up was the Bone Garden Cantina. This place is hard to find but worth the effort. They specialize in authentic Mexican food. Second up was my single most favorite restaurant, bar none. 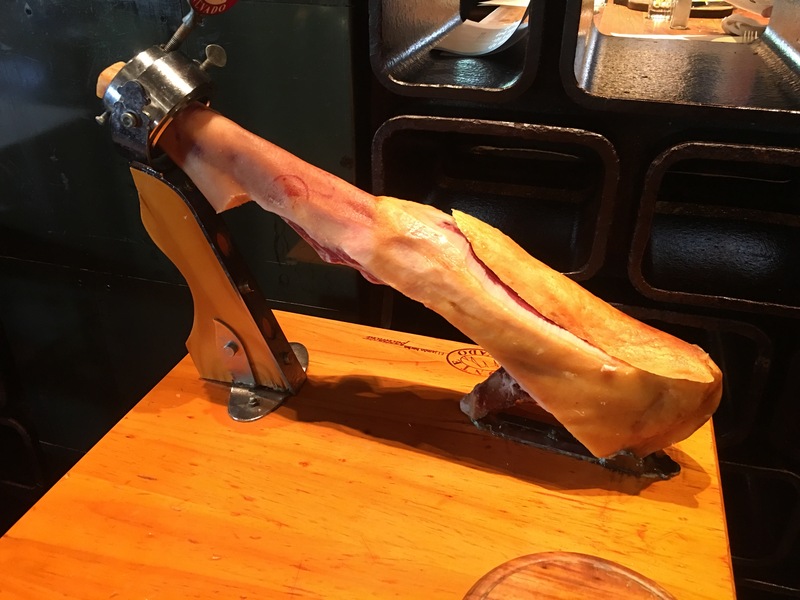 Barcelona Inman Park was my choice for Father’s Day. They specialize in tapas and other Spanish dishes. I’ve never had anything here that wasn’t perfect. I highly recommend you give them a visit. You can thank me later. 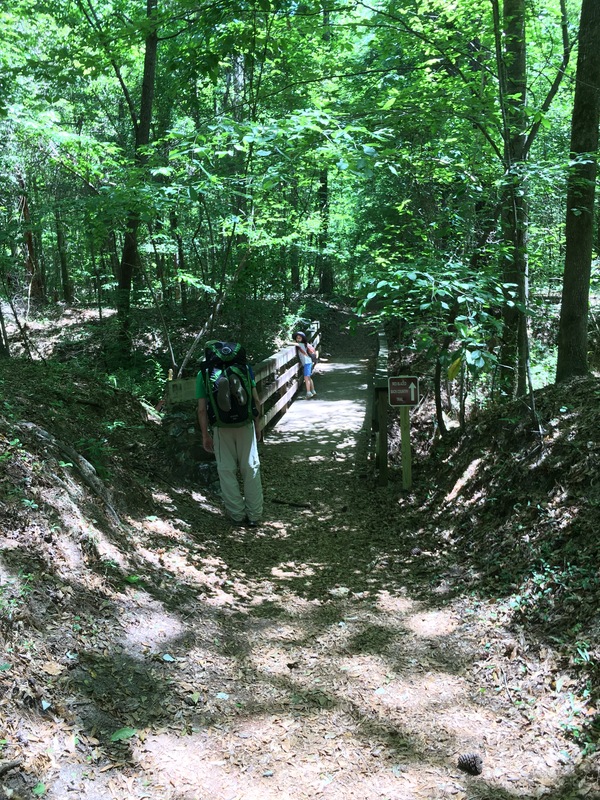 This 5.0 mile trail was also at Kennesaw Mountain Georgia. I hiked this trail back to back with the Mountain trail making for a 10 mile and 94 flight day. My feet reminded me that I’m still working my way up. The trail itself had rolling hills but was notably more flat than the Mountain trail. 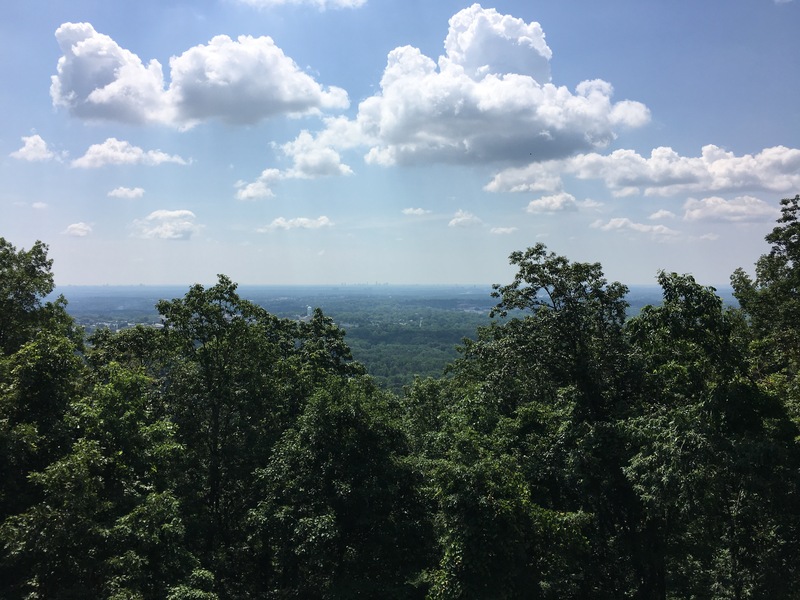 I noticed the complete lack of water on Kennesaw Mountain. It made me wonder how so many men could be supported here. This trail gave some of the answers. The troop lines were closer together here, but it was clear to me that the Southern troop line extended off the mountain and past a significant stream. This must have been to protect a water source for the men. The number of people reduced steadily as you leave the main mountain area. Still, the park was being heavily used for hiking, trail running and dog walking. There were many alternate parking areas were you could have easy access to one trail or another. It would take a little time to explore all this park has to offer. 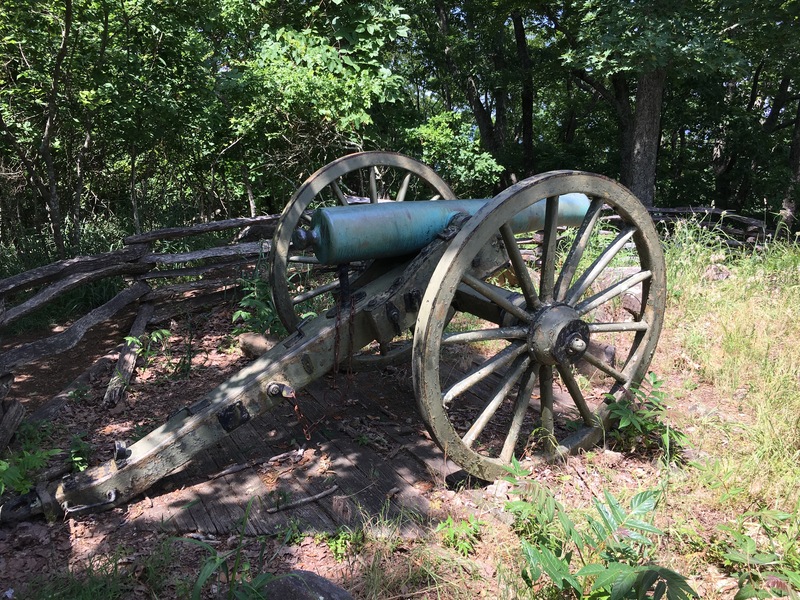 Kennesaw Mountain NMP was the location of a major battle in the taking of Atlanta during the Civil War. 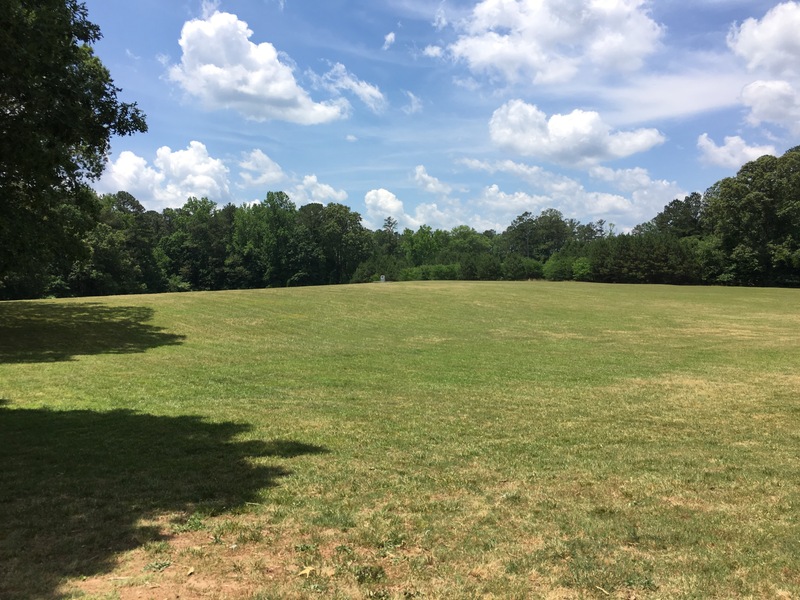 The high ground was owned by the confederate army. 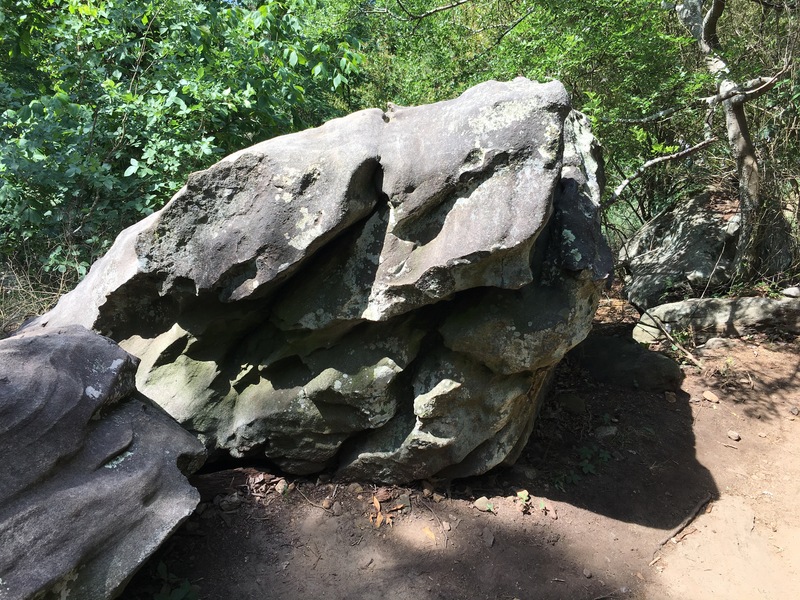 The full hike is 5.0 miles up the main mountain and the neighboring Little Kennesaw Mountain. There are shorter or longer options available. There is also a shuttle to the top if you don’t hike. The park is free to the public and was very busy on this Memorial Day. The hike starts at the gift shop and proceeds up the mountain at a challenging incline. It is roughly a mile to the top. 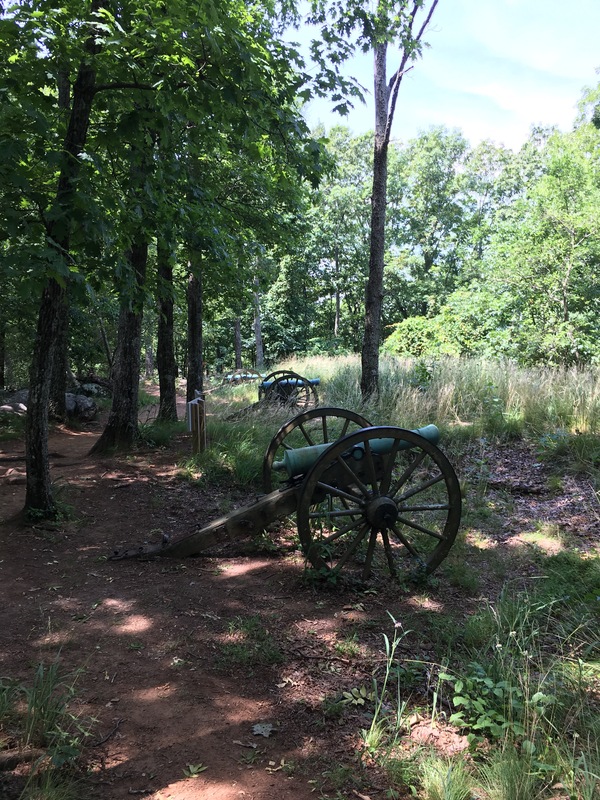 Being Memorial Day, cannons were being fired at the base of the mountain as I made my way to the top. Once there, you can see the position of four cannons and a scenic view of downtown Atlanta. It made me wonder what the view would have been during the Civil War. Past the Atlanta skyline, you can also see the distant Stone Mountain. 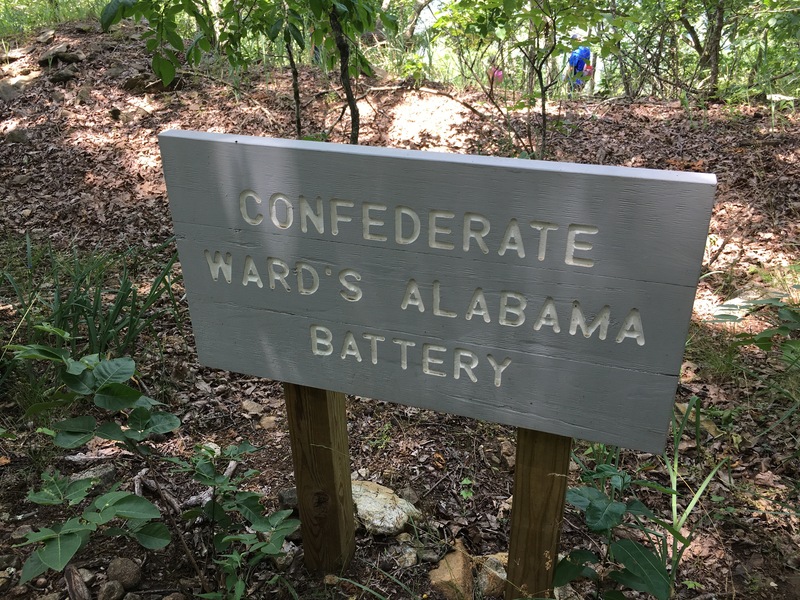 The confederate soldiers were at a disadvantage even holding the high ground. The Southern cannons were inaccurate smooth bores while the Northern troops had highly accurate rifled cannons. 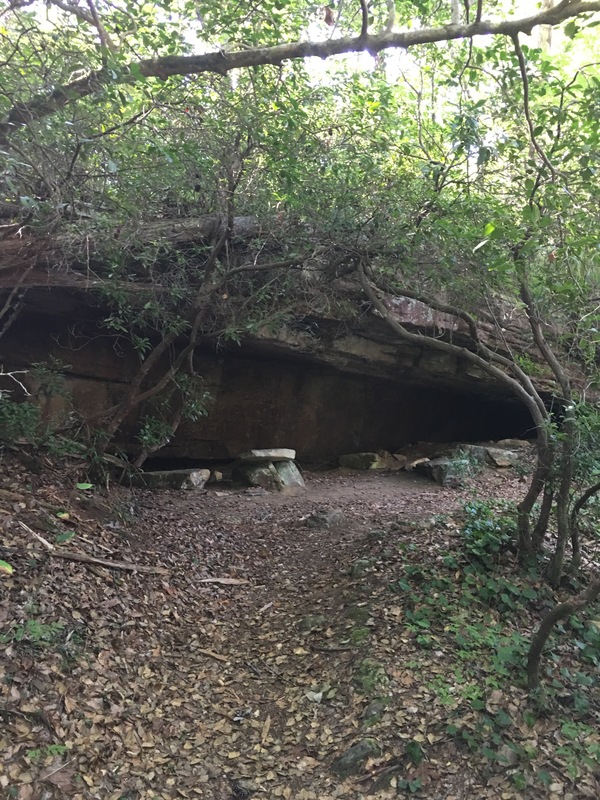 The entire mountain was covered in trenches built by Southern soldiers for protection. 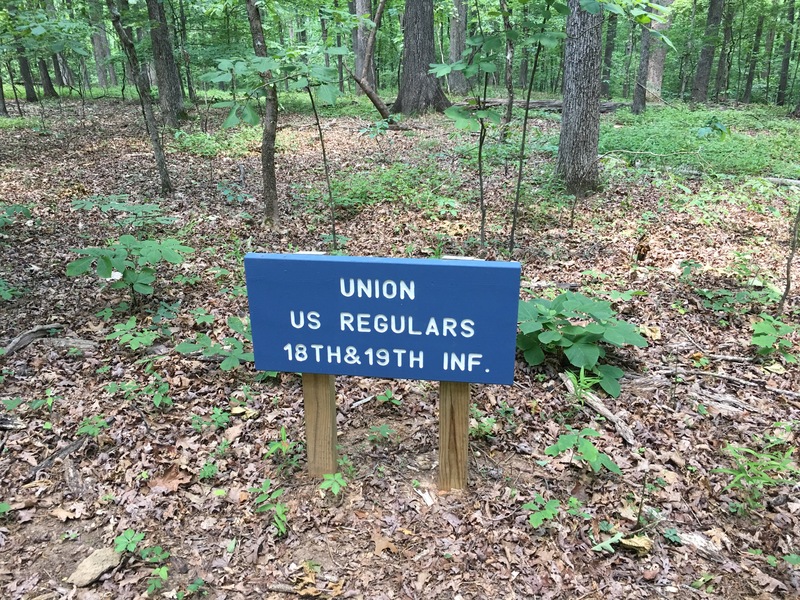 Troop positions were noted on signs throughout the park. 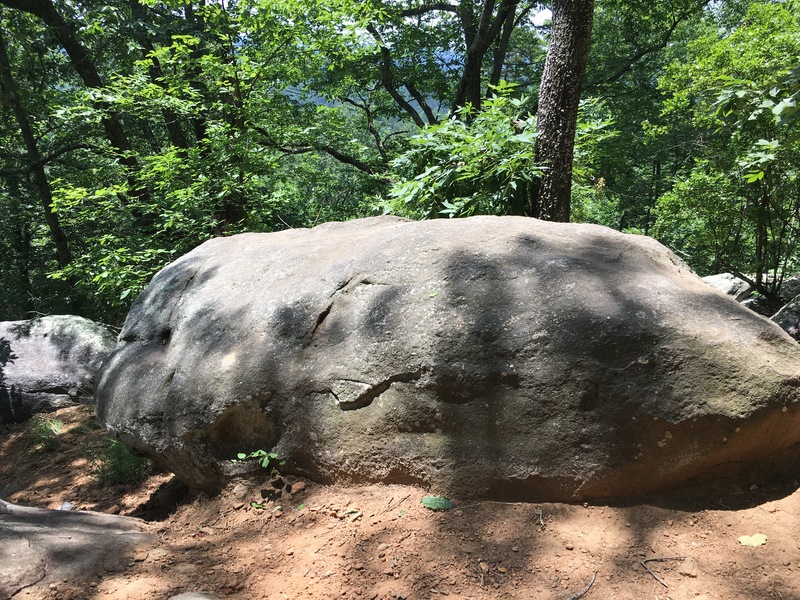 The mountain itself was covered in large boulders that no doubt played a role in protecting Northern troops as they took the mountain. 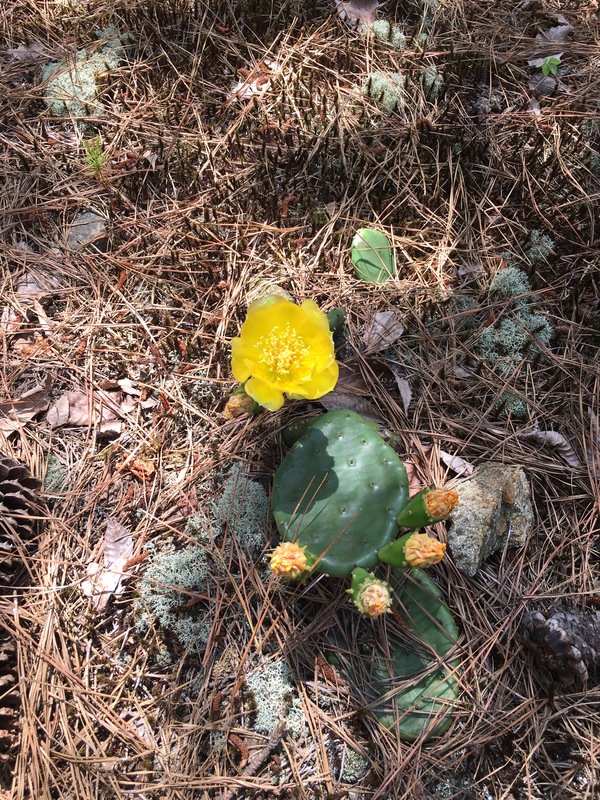 The top of the mountain was covered in bluming cacti which are unusual to the area. 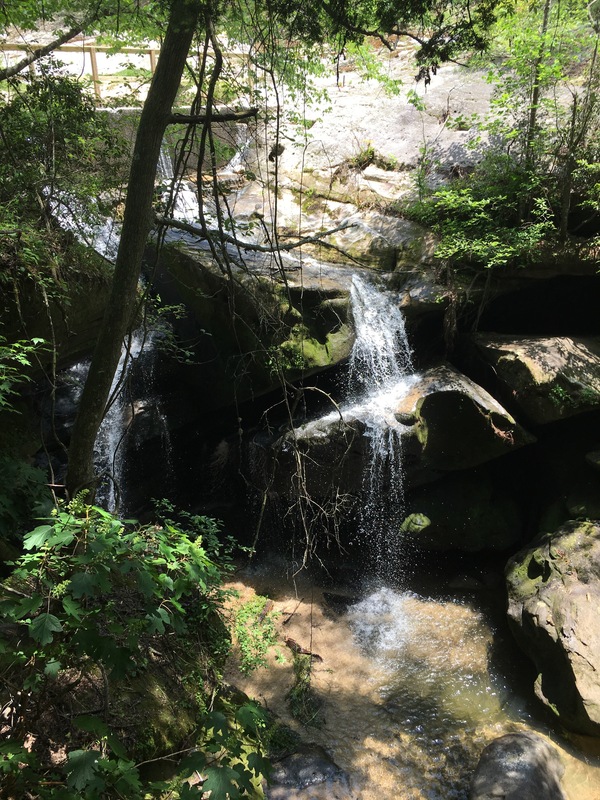 This is a lovely mountain hike that can be added to an Atlanta visit. Still, the constant trench lines remind you of what happened at this place. Many of the wounded from this battle and those that followed were transported by rail to a small, inadequate hospital beside Auburn University, my alma mater and current town. Most to never recover. Dismals Canyon, about a hour north of Jasper, was one of my favorite hikes yet. 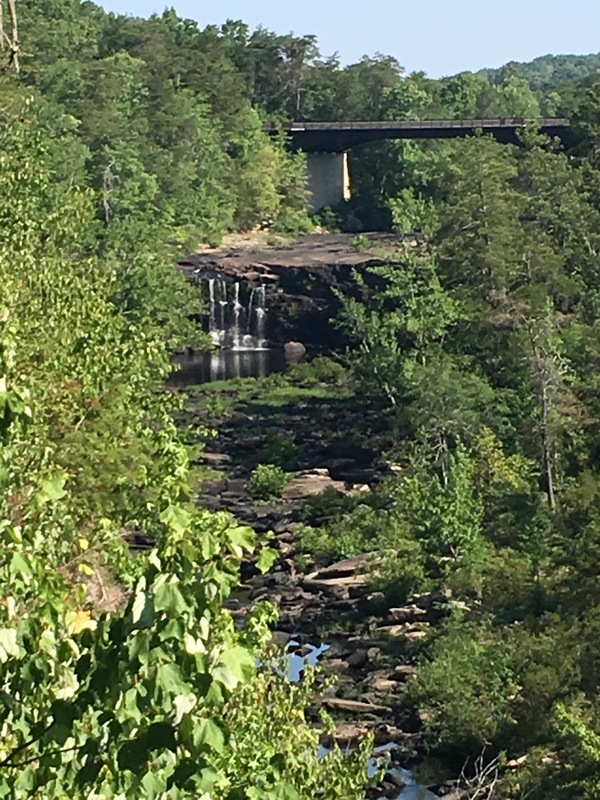 It is near the town of Phil Campbell, Alabama and continues the same rain forest feel as Natural Bridge. I can’t imagine why this hike didn’t make the top 50 other than being short and on private property. The location was nicely developed with a soda counter for lunch and a covered deck for resting. 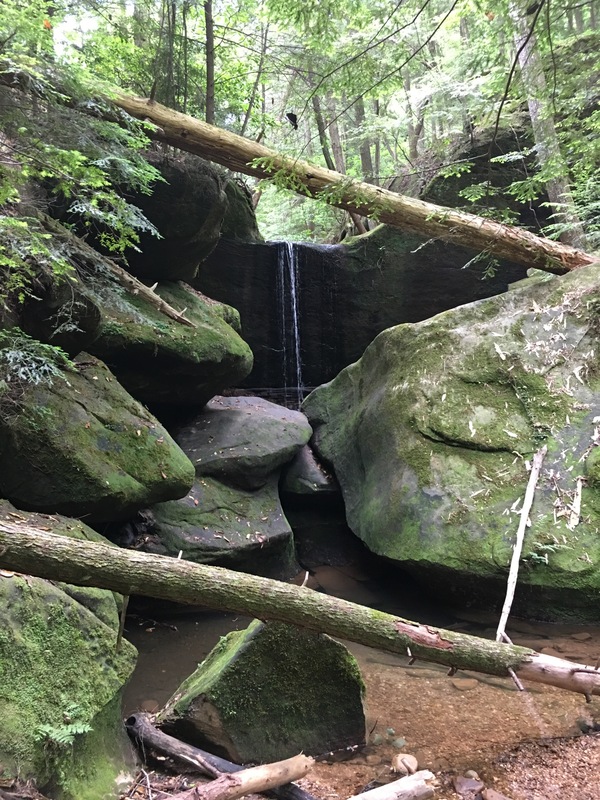 The hike itself proceeds down about 5 stories into the canyon and continues 1.5 miles though spectacular scenery with a creek crossing or two along the way. On this hike, do make a reservation one week in advance for the day/night combo. The canyon is known for what they call “dismalites”, a type of glow worm if you will. These are only found in a few places in the world. My understanding is that this larvae lives about six months. They weave a small silky web around themselves and glow to attract food sources into their webs. It was explained that the larvae were the main reason for the notably fewer mosquitos in the canyon. Still, bug spray and a red lens flashlight would be recommended. 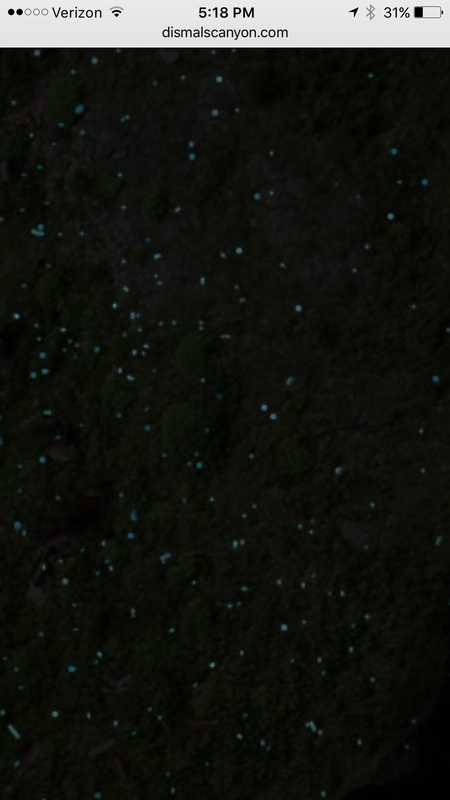 On the .5 mile guided night tour, they take you to several darker areas were you can view the glowing larvae. I was unable to capture this on my camera but borrowed a photo from their website. 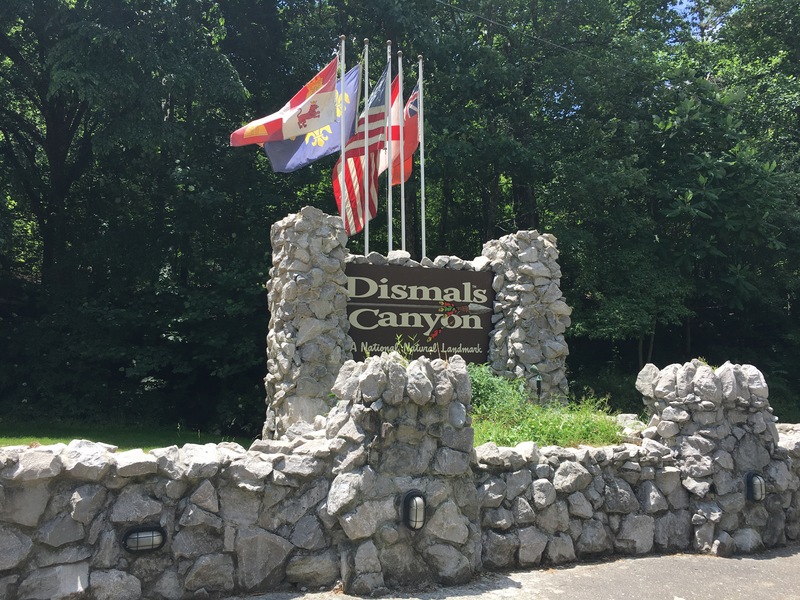 We were told that Jessie James used this area as a hide out and was one of the first to write about the Dismalites. I can only compare the view to looking at the night sky. It was a very interesting treat. We had some time to kill between our day hike and night tour. 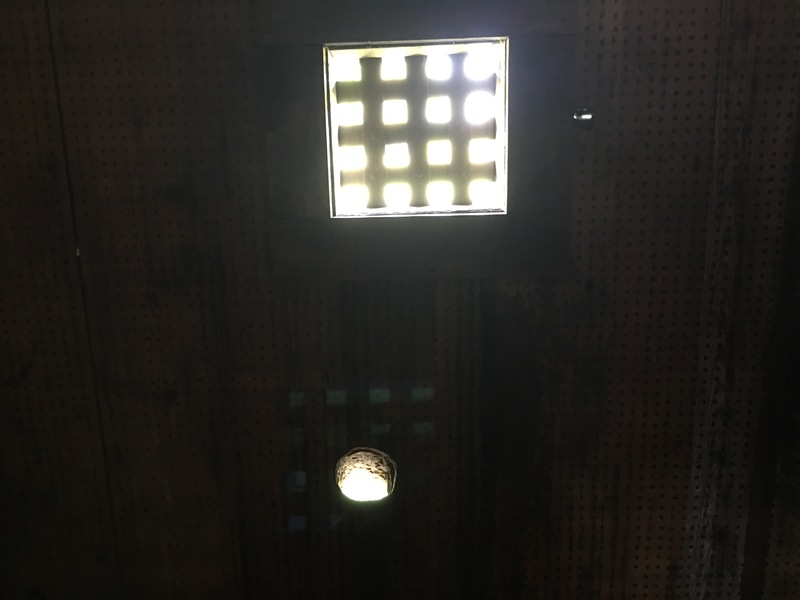 We explored the nearby Bankhead National Forest and the Houston County Jail. 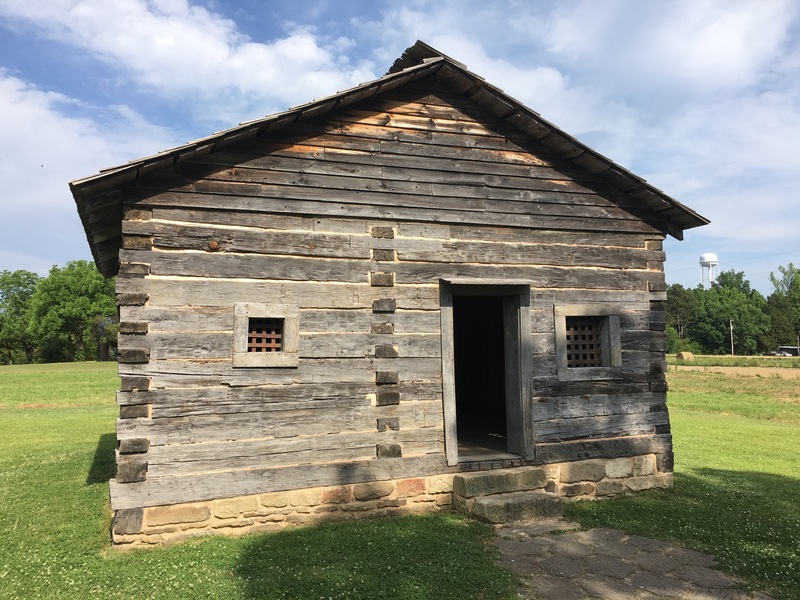 The jail is the only surviving log jail in Alabama. It was very small and had convenient urination holes through the logs to the outside. I guess they didn’t plan on holding many female prisoners back in the day. 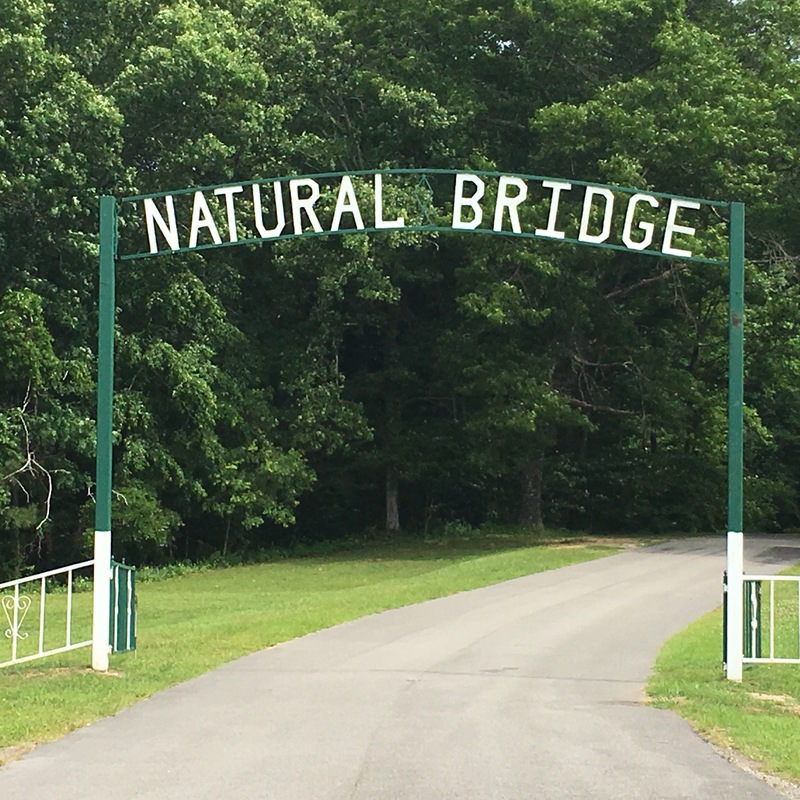 Natural Bridge is found in the town of the same name just North of Jasper, Alabama. 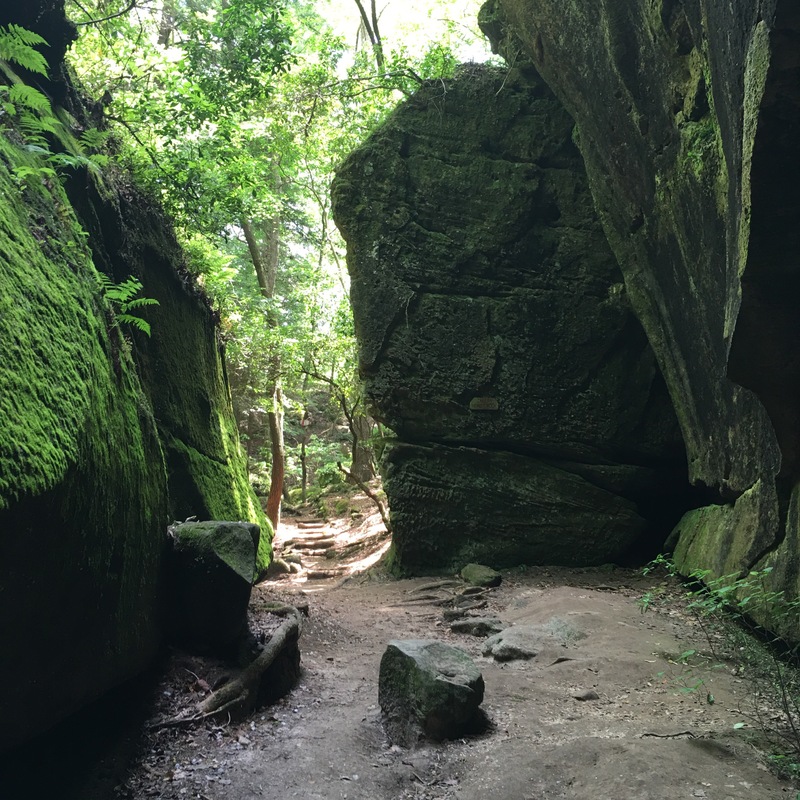 It is a short 1.0 mile hike to one of Alabama’s neatest geographical features. In fact, the hike is optional. The bridge itself is only about 100 yards from the ticketing area. 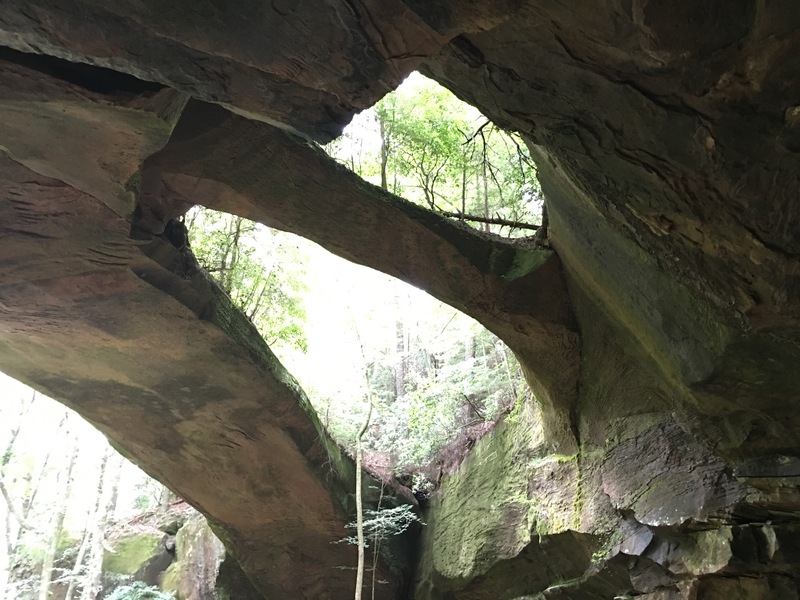 The natural bridge was made by a plume of iron ore stretching over sandstone beneath the ocean that once covered Alabama. When the ocean receded, the sandstone washed away leaving the iron ore bridge. 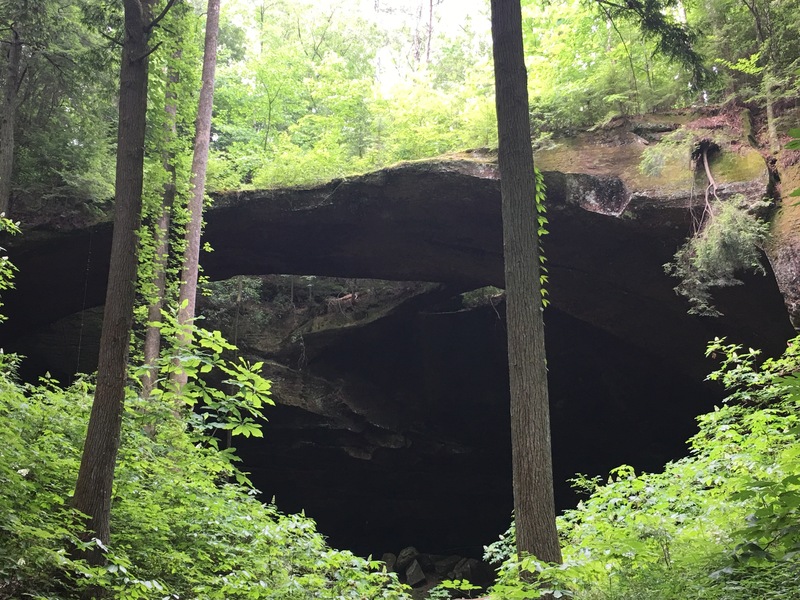 The hike passes the natural bridge and continues on a short loop through an equally impressive canyon. 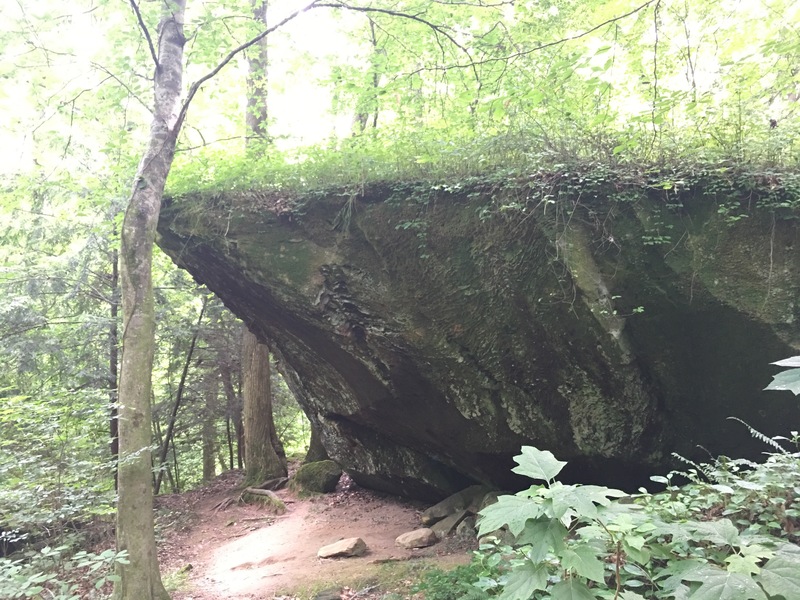 The high, jagged rocks are also worth the visit. I’ve never really explored this part of Alabama. The entire area felt more like a rain forest than is typical of Alabama. Don’t forget the bug repellent as the shady, moist conditions were perfect for mosquitoes. For dinner, get off the main roads and go into downtown Jasper. The old part of town was charming and filled with nice places to eat. 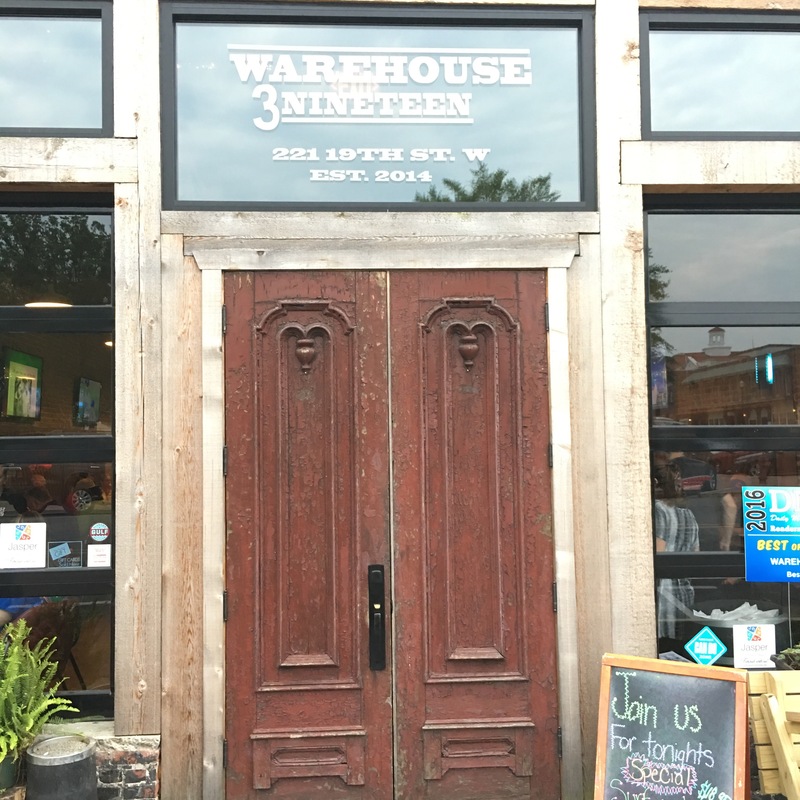 We ate at Warehouse 3 Nineteen. Everyone enjoyed the meal as well as the warehouse charm. You don’t want to miss it. 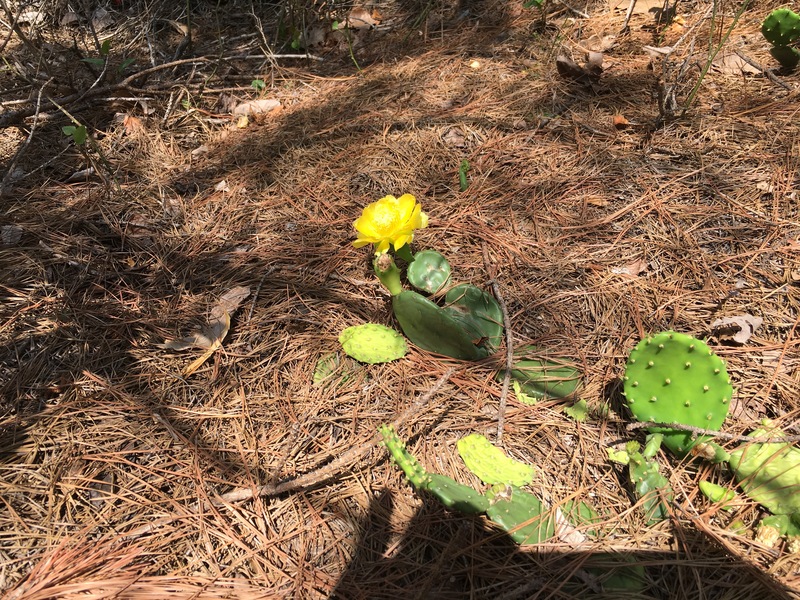 Today, I slipped across the border and had my first hike from my new book “Hiking Georgia”. 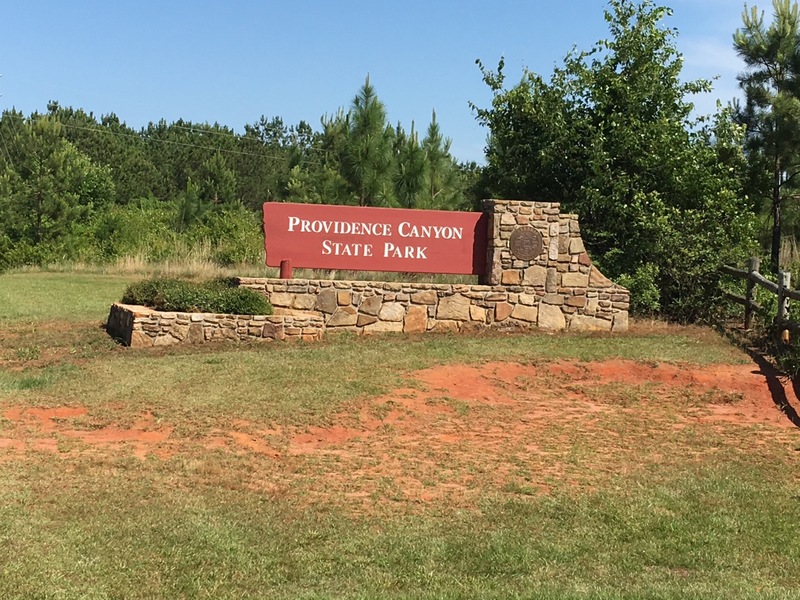 Providence Canyon was a state park but is now listed as an outdoor recreational area. Regardless, the facilities and trails were in great shape. Providence Canyon has two trails. We took the 6.7 mile back country red trail. They also have a 3 mile white trail that skips the back country but gets you to the canyon itself. Wear appropriate footwear for this hike. The first mile of this trail was literally down a stream. The water was just over the surface and the footing was firm but it was a little odd walking through running water. The red trail eventually leaves the creek and circles through a spectacular forest. The trail is wide and clear. The towering hardwoods provided nice shade for the entire hike. Most of this trail is flat either at the top or bottom of the canyon. There are a couple of very step inclines in or out of the canyon, just enough to keep the hike interesting. We were credited with 28 flights of stairs on this hike. The back country portion of this trail also had several nice camping areas for those looking to get away. The best views and photo opportunities came in the last mile of the hike. Ironically, this mile is close to the entry road making it possible to see the canyon without hiking. I was impressed with the traffic on the trail. It was a beautiful day and a lot of people were on the trail. The picnic areas were also being used by groups. I would rate this hike in the top quartile of my hikes. 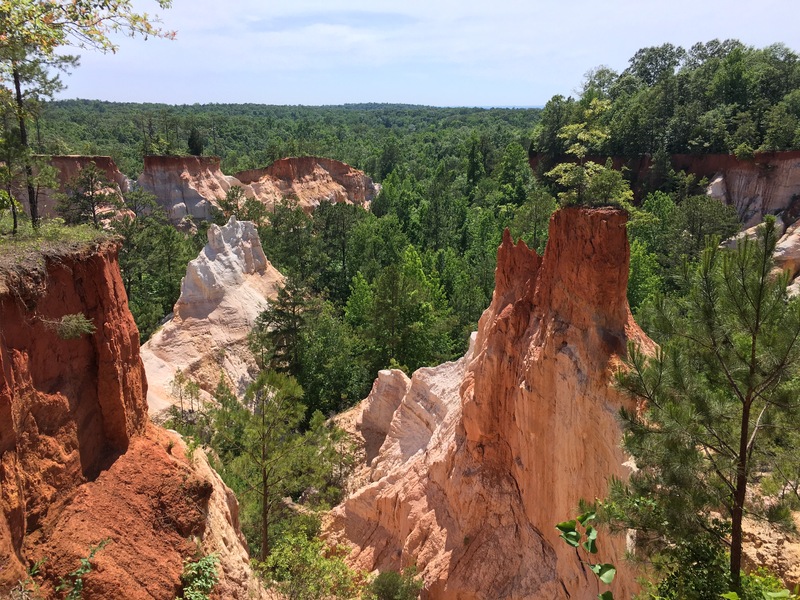 Providence Canyon is worth a stop. 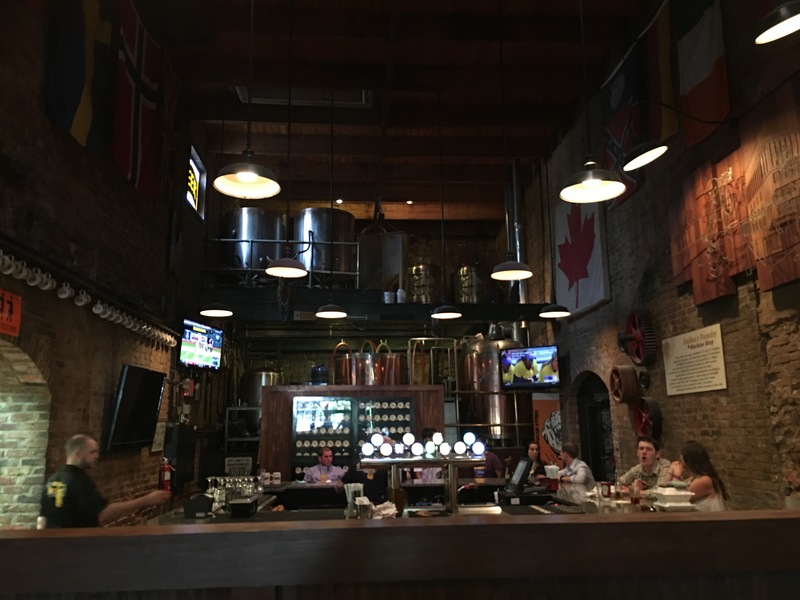 For dinner, we circled back through Columbus, Georgia and stopped at the Cannon Brew Pub. This restaurant was in a restored brick building downtown. The food here was a mix of American fare and British pub food. We all enjoyed our meals. 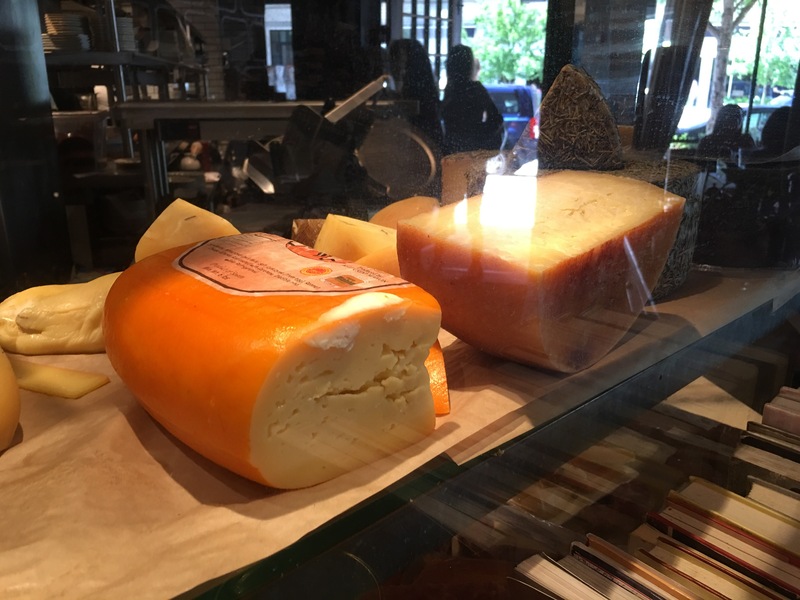 Give them a try when in town. 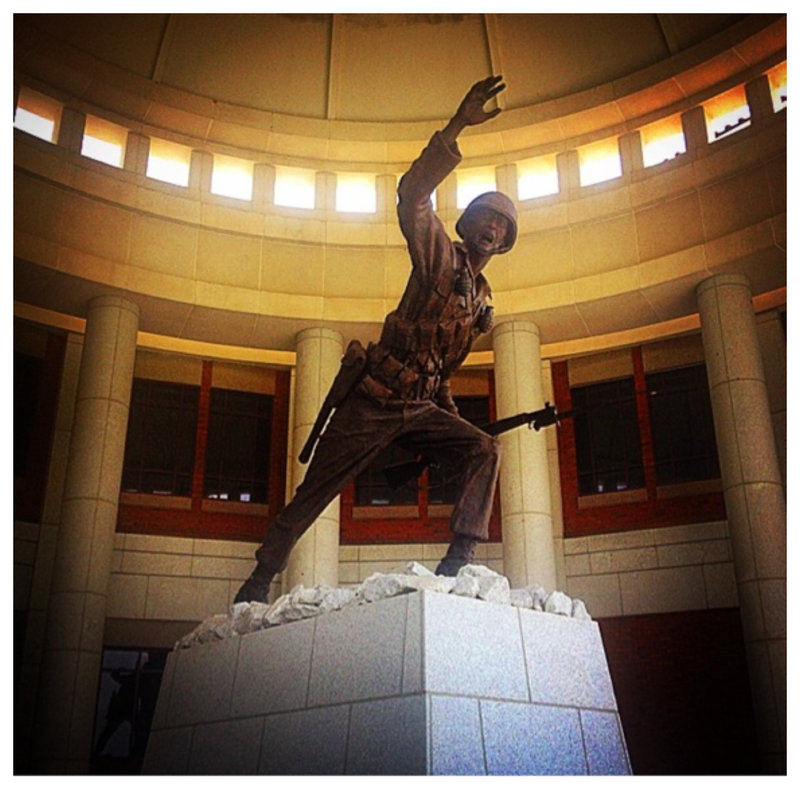 A nice side trip in Columbus would be to the National Infantry Museum just inside Fort Benning. We didn’t have time today, but the museum is very nice and worth your time to visit. 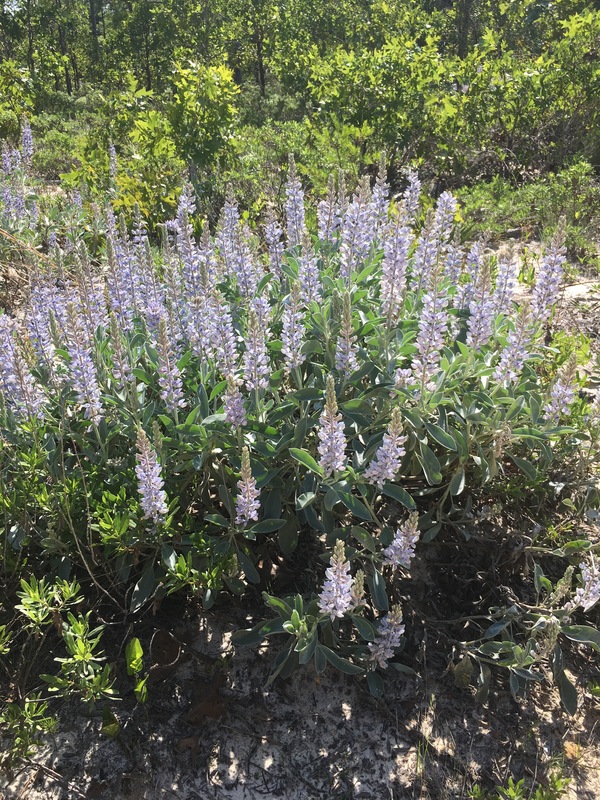 This week’s hike is both unusual and special to my family. 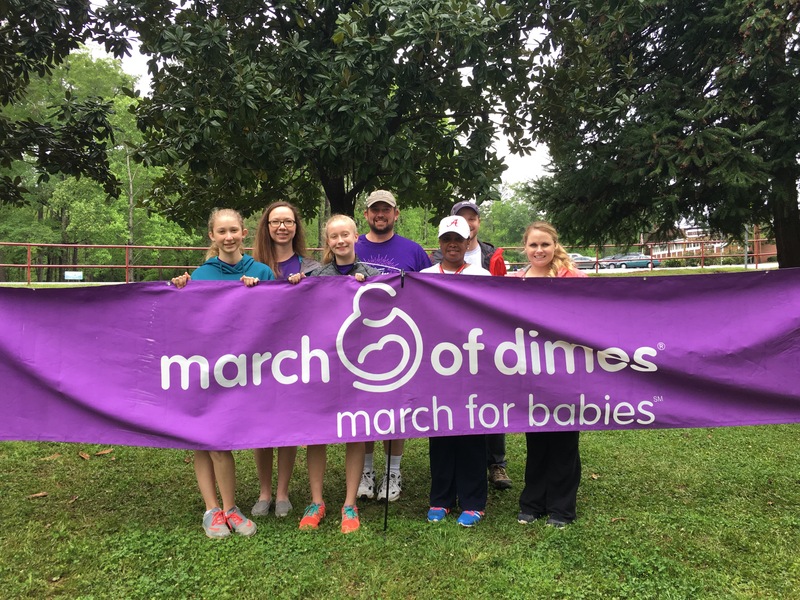 The 2016 March for Babies takes place each year in the Opelika Municipal Park and surrounding neighborhoods. In fact, the walk is in the neighborhood where I grew up making it oddly familiar. 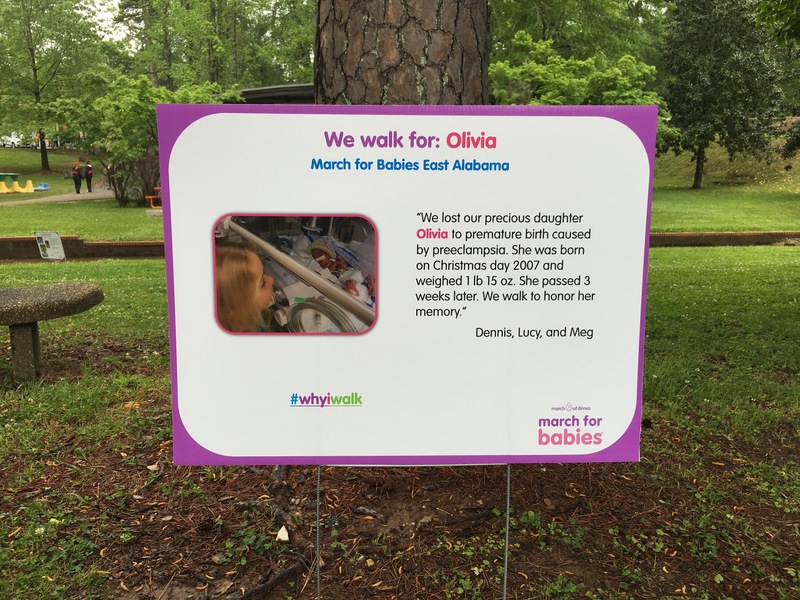 We walked 4 miles in memory of our lost daughter, Olivia and in celebration of our healthy daughter, Megan. The park was full of music and cheerleaders today as the walkers gathered. Each family has their own reason to attend each year. The stories are very touching. 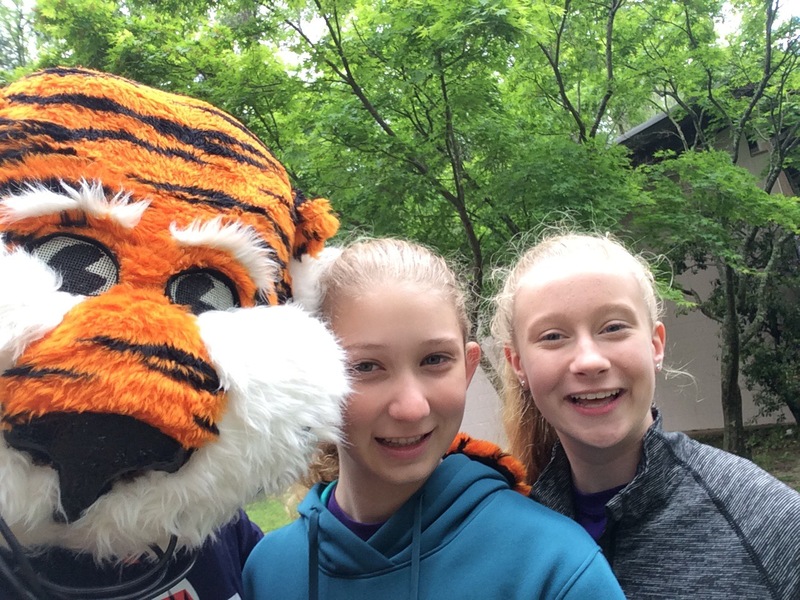 My main reason to blog today is to thank everyone that took the time to donate to our cause. We love and appreciate you all. We sold 4,560 candy bars, 1,000 Chic-Fil-A biscuits, 200 tee shirts along with countless donations. 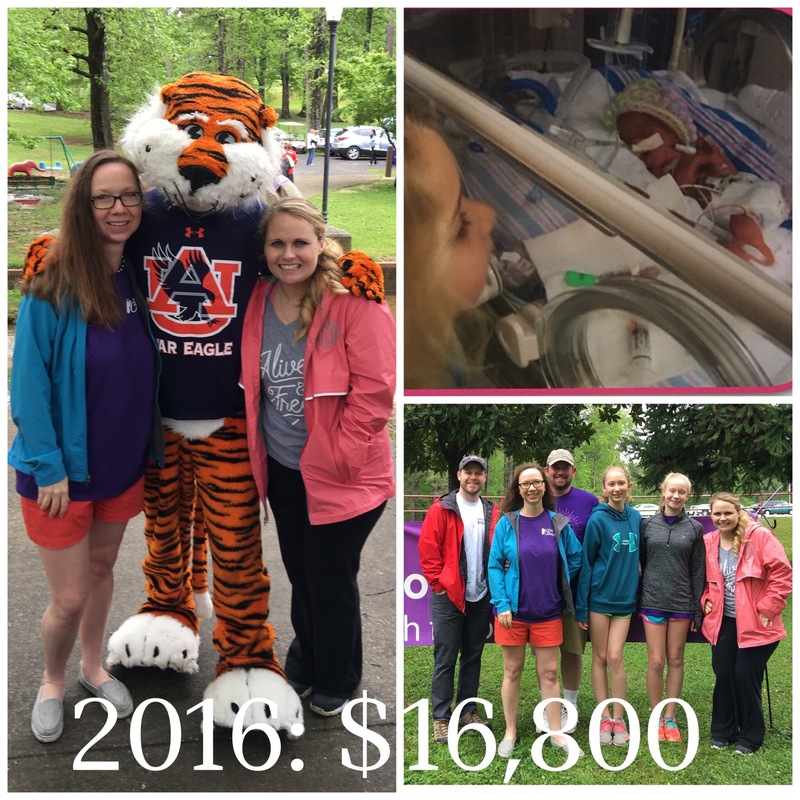 With your generosity, we raised $16,800 for the March of Dimes. This is a team record. I also understand that it is a regional record as well. We are thrilled and can’t thank you enough for your support. We’ll be back next year!